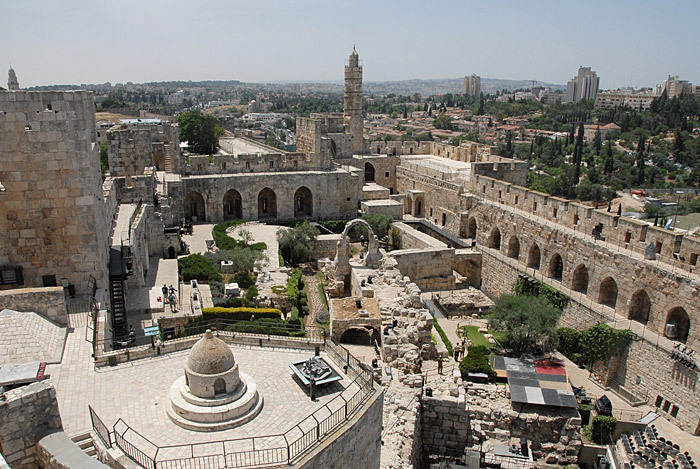 The whole of Jerusalem is a fairly big city but most of what visitors want to see is contained behind those walls, the Old City, .35 square miles of ancient history and intense (InTense!) emotions. In 1542 Suleiman the Magnificent rebuilt the Jerusalem walls and included eleven gates, seven of which are in use today. "Until 1887, each gate was closed before sunset and opened at sunrise." ...and this is the Lions' Gate. There's a wiki story on every one of the gates that you could read at your leisure. 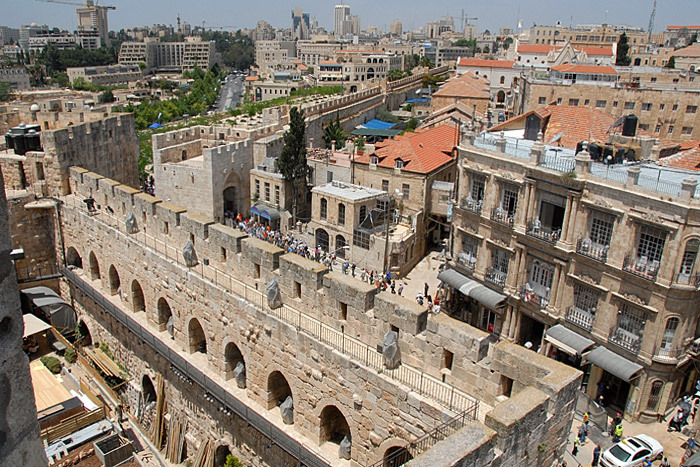 "The old walled city, a UNESCO World Heritage site, has been traditionally divided into four quarters, although the names used today—the Armenian, Christian, Jewish, and Muslim Quarters—were introduced in the early 19th century. ... In the course of its history, Jerusalem has been destroyed twice, besieged 23 times, attacked 52 times, and captured and recaptured 44 times." There are market streets inside the Old City so packed with people and goods, I couldn't get off a single shot and am probably not going back on those streets, not to the surprise of anyone who knows me. I was continually lost, well not really lost, just wandering around not knowing where I was. The colors of the flag of Palestine. 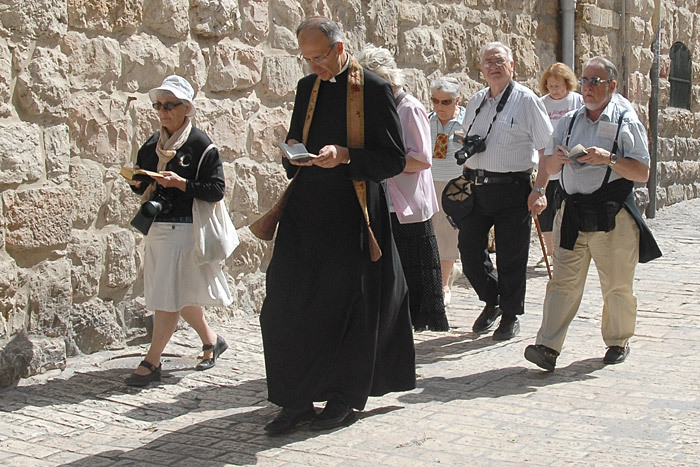 Following along the path of the Stations of the Cross is a big tourist attraction. This group is carrying a cross and they were loudly singing a dirge-like tune. 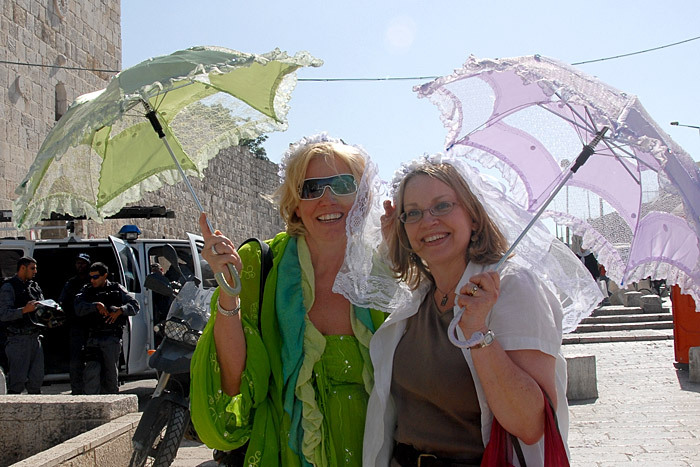 More travellers along the Via Dolorosa. 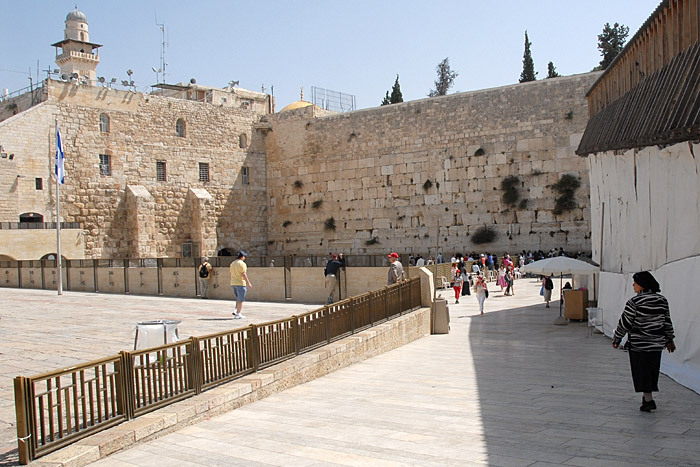 This is the Western Wall. To reach this point you have to pass through metal detectors and there is a very visible police presence. 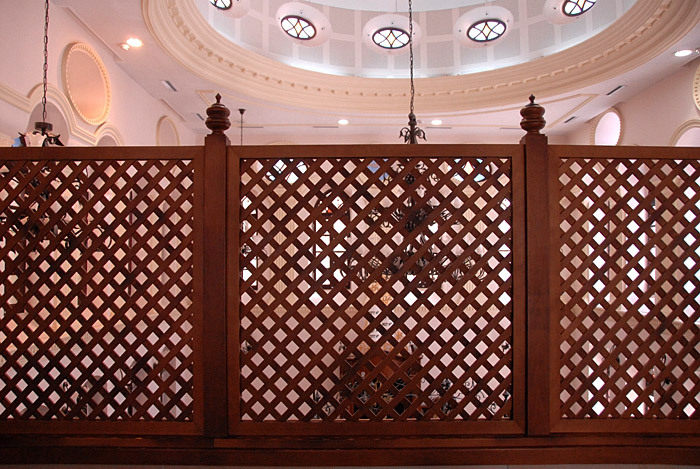 There's the one obvious fence you can see and then inside the praying area there is another fence that separates the men's section from the women's. This path leads to the much smaller, the women's section. We can see here what the men are doing. What are the women doing? Peering over the fence at the men! 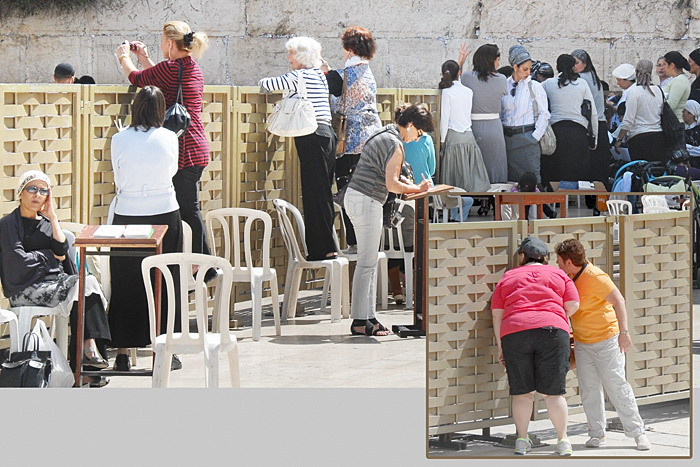 Also there was a group of young boys doing something in unison beside the fence and I'm guessing many of the local women were the moms trying to catch a glimpse of their sons. Standing just outside the praying area, here is a panorama of the surrounding buildings. Where did all this space come from? "The Moroccan Quarter, which was located adjacent to the Western Wall, was vacated and razed to make way for a plaza for those visiting the wall." I'm probably in his picture too. 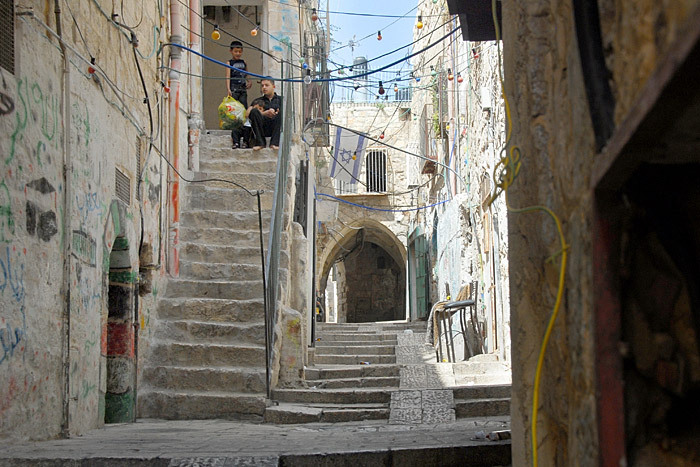 More of the unknowable streets of the Old City. 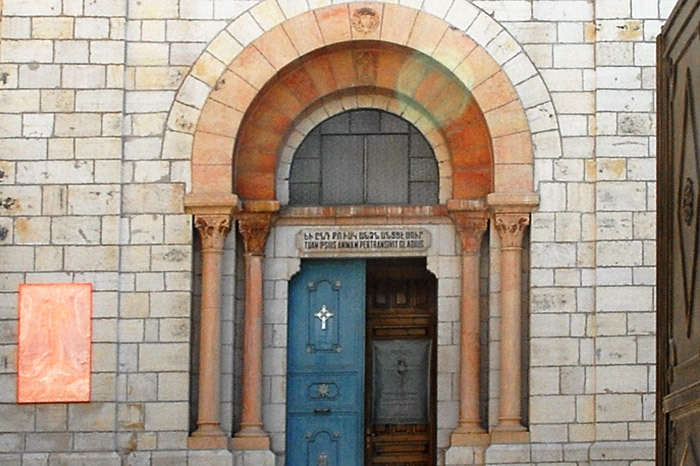 Behind every door and through every arch is more more more. 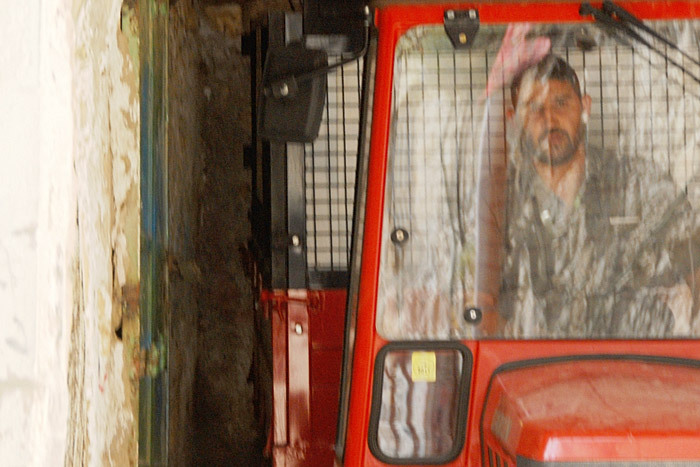 The only vehicles that pass through are narrow tractors pulling narrow carts to pick up trash and make deliveries. There are small ramps built into most of the stone stairs to allow the tractor to pass. 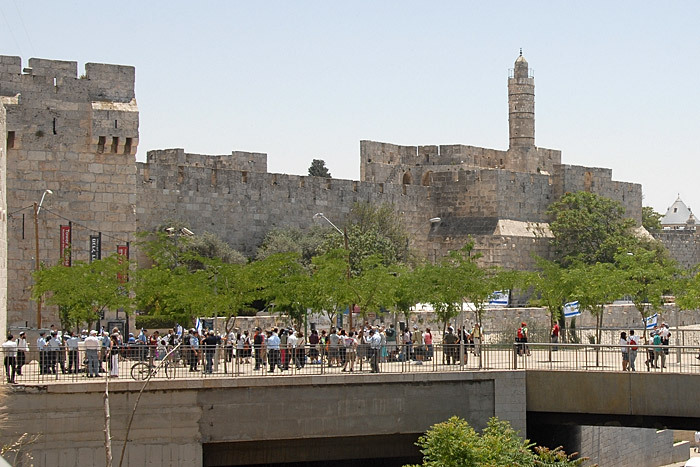 By the Jaffa Gate is the Tower of David and the Tower of David Museum. 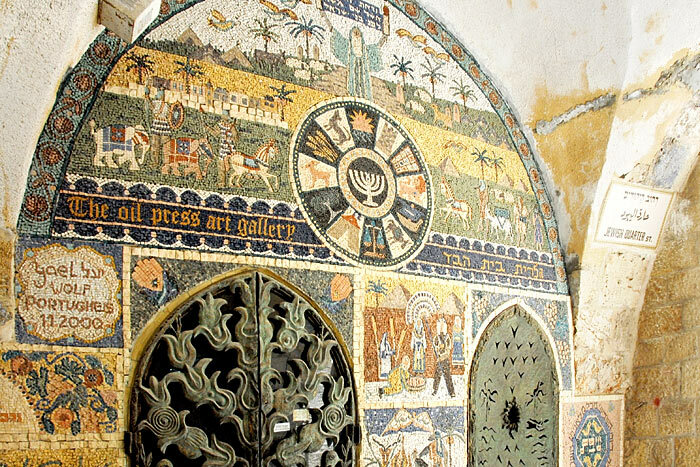 The museum is a chronological story of Jerusalem set in individual rooms as you move through the structures. I particularly liked the movie where they told the story pretty much just sticking to when the city changed hands, which was enough to follow, managing quite well I thought in just fifteen minutes. I'd like to see it again. A view down to the Jaffa Gate and the river of tourists flowing in. These guys were playing loud military music on a boombox and doing war drills with their flags - lunging and striking and whipping those things around, and then lining up to race up and down the plaza yelling like mad. 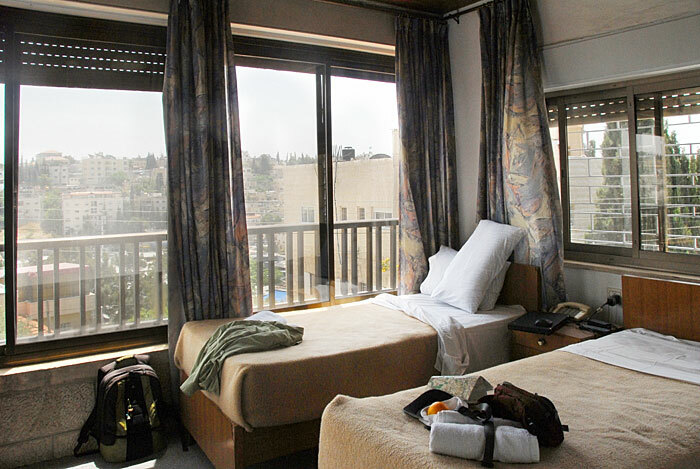 ...I am actually staying in East Jerusalem, 15 minutes walking to the Old City and an entirely Palestinian community. I'm very happy here at this hotel. The people have been great, the room, the breakfast, the location, are all great, and the price is right. 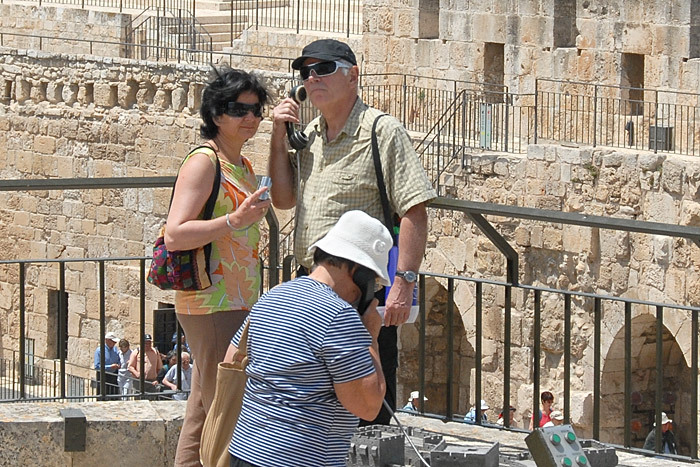 There is virtually no overlap between the Jewish and Arab communities maybe not even among the tourists. Like Jonathan said when looking at my map, with a sweeping hand 'here, all Jews, no Arabs, here, all Arabs, no Jews. 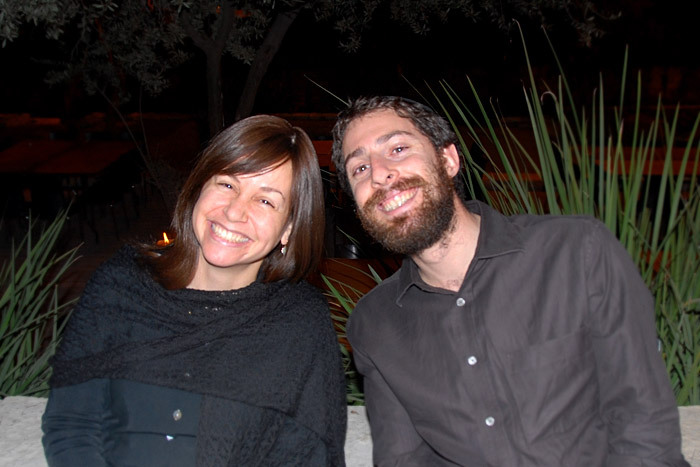 Jews, Arabs, Arabs, Jews'. Ah, were it only that simple. I do get lost every single time I walk out the door and some stranger on the street always leads me back. I'm trying to figure it out, where I go, and then remember how to return but it might take another day or two! When I checked in I told the guy that I like rooms with lots of light. This room has two full sides with windows and a third side has a door leading to a balcony. This is the view from the balcony. The tower is the minaret with the loud speakers for the five times a day call to prayer. HURRAY! 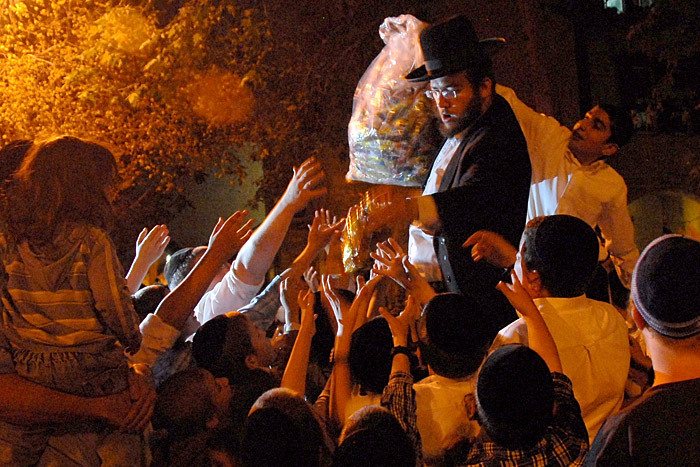 Mazel Tov!! Lucky ME!!! I got to have dinner with the newlyweds - Judy and Jonathan. I've know Jonathan for his Whole Life, his many lives actually... his LA growing up years; his off to college years; I visited him during his Korea years; and now here he is married to a wonderful woman and about to become a citizen of Israel. You go Jonathan! Ahh, Happy young people just starting out. What an adventure! I got a passer-by to take this one. No, I'm not trying to strangle her, she's just so darn cute. That's a lot of police down there on the plaza. That's where the flag wavers were from yesterday but yesterday there were no police. 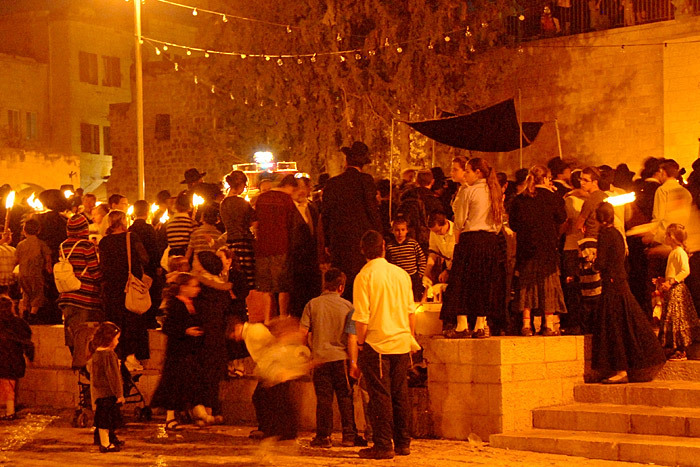 When I got there I learned of Jerusalem Day. 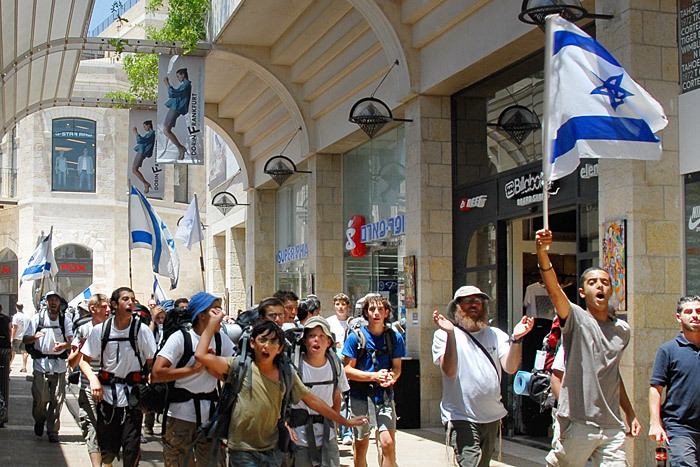 This is in a snappy mall near the Jaffa Gate with a Gap, a Limited, and many other well-known mall shops. I went here to get out of the sun and to buy a map and these guys came tearing past. My day was actually very odd. 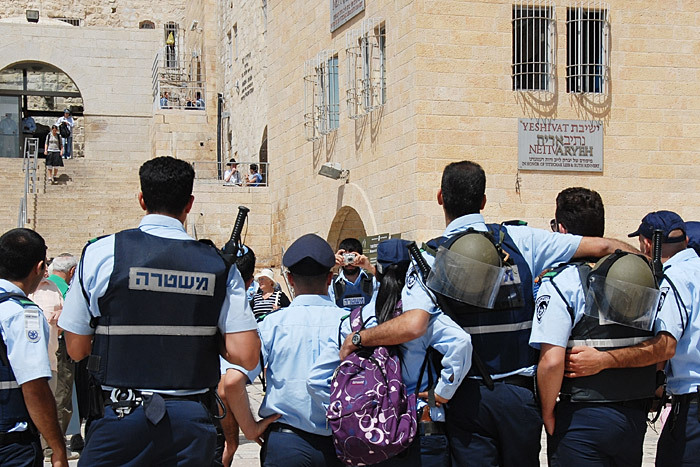 There was the unexpected drama of Jerusalem Day, and that my two intentions were not to be. 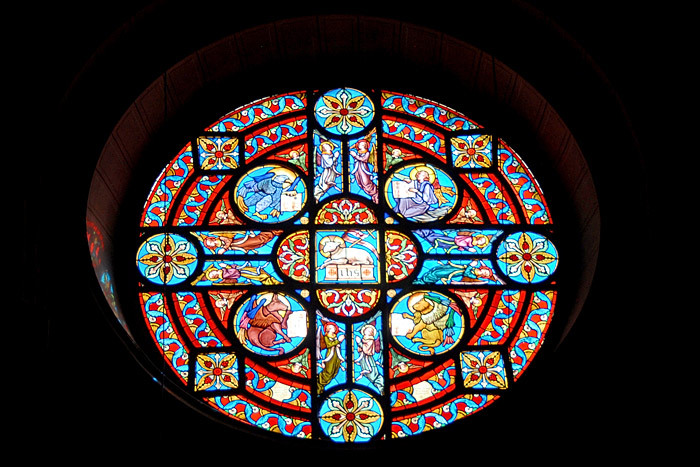 1) I had intended to take the bus up to the Hadassah Hospital where there are some magnificent Chagall stained glass windows, but I learned at the information center that the windows were closed until July 31st. 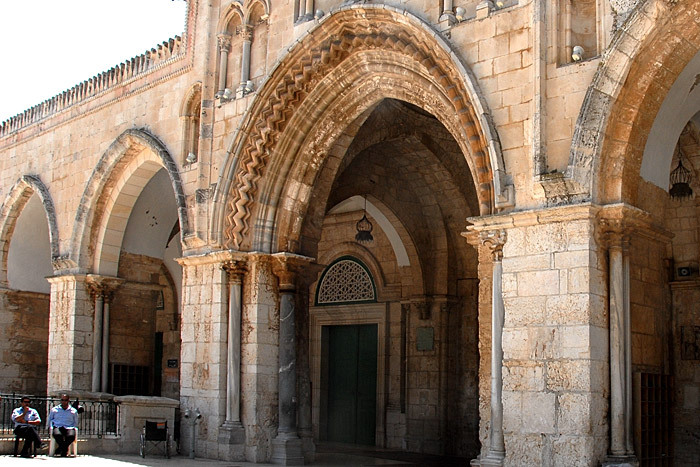 2) I had intended to go to the office of the tour company I wanted to use to organize some out-of-Jerusalem visits but they no longer had an office in Jerusalem, everything had to be done online and on the phone. 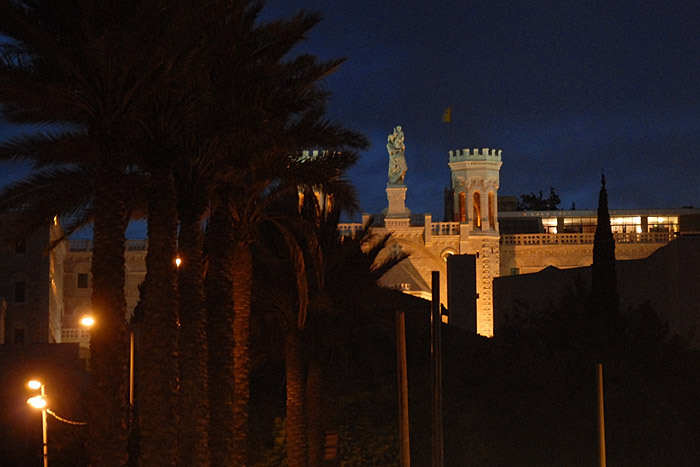 So hot, foiled, and weirded-out, I decided to walk up the hill to the King David Hotel and the YMCA, two important structures in the life of Jerusalem. 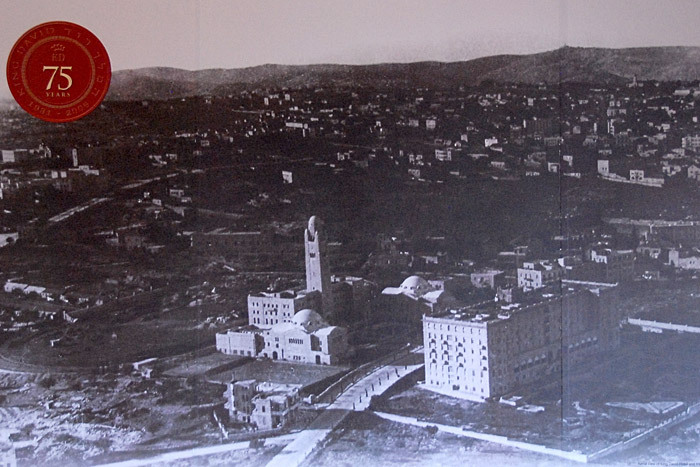 This picture is from the early 30s with the King David in front and the YMCA behind it. 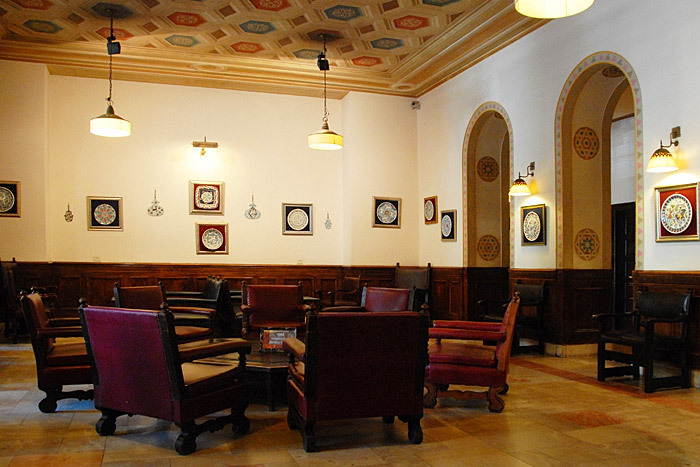 A bit of the inside of the King David Hotel. 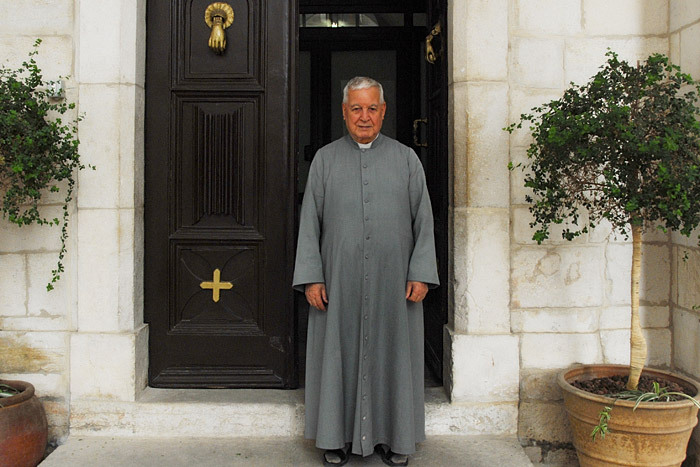 "Here is a place whose atmosphere is peace where political and religious jealousies can be forgotten and international unity be fostered and developed." The reception hall at the YMCA. 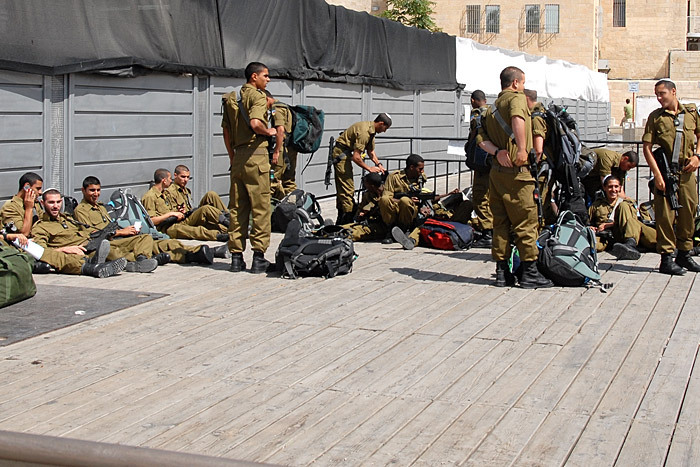 I tried to find a quick summary of Israeli military service requirements but did not succeed. 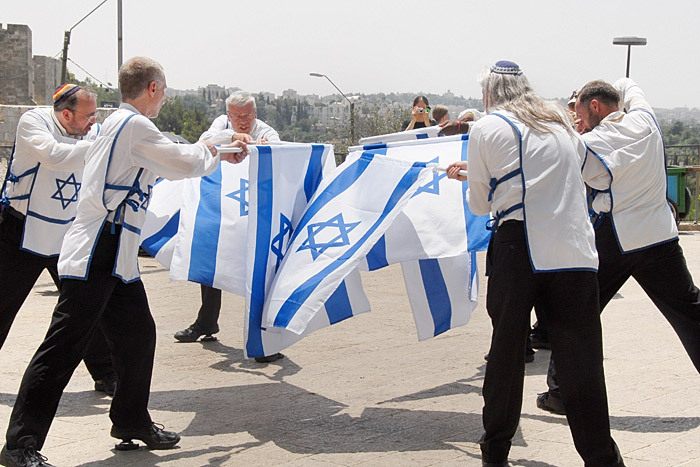 In general though, I think it's true that basically every Israeli is required to serve, with exemptions at least to the very Orthodox, and maybe others, but basically, everyone serves. This is a system that suits me actually. 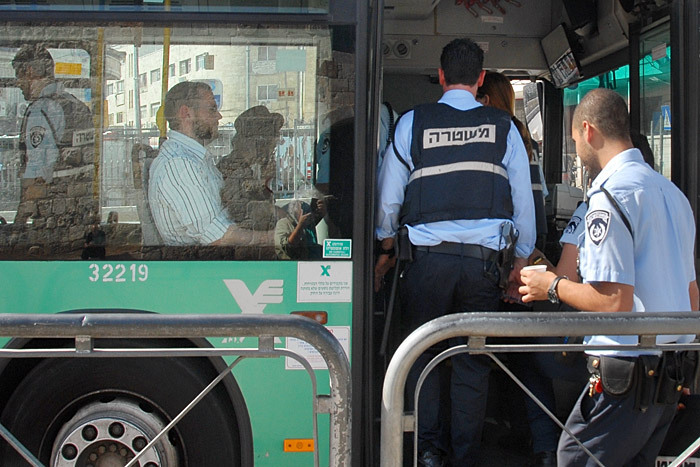 That's folks from a police unit getting on the bus to go to their assignment. I have no idea, but who could resist? Not me. When I went out this morning I took a picture at each of the critical intersections, to impress upon myself how to get back. Hurray, it worked! You know, sometimes you just want to get on the bus. It's got pumpin' a/c inside the bus, it's comfy, high off the ground for views of the countryside, and takes you exactly where you want to go. Yes, sometimes you just want to get on the bus. 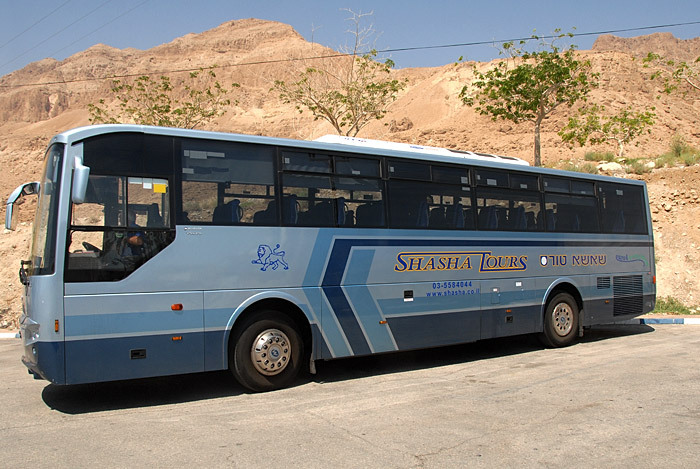 This bus is off for a tour of Masada and the Dead Sea. The guide assured us these were the exact caves where, in 1947, young Bedouin shepherds discovered the first of the Dead Sea Scrolls. The details of the story that the guide told doesn't match 100% with Ms Wiki's story, but close enough, and the guide's was more colorful. 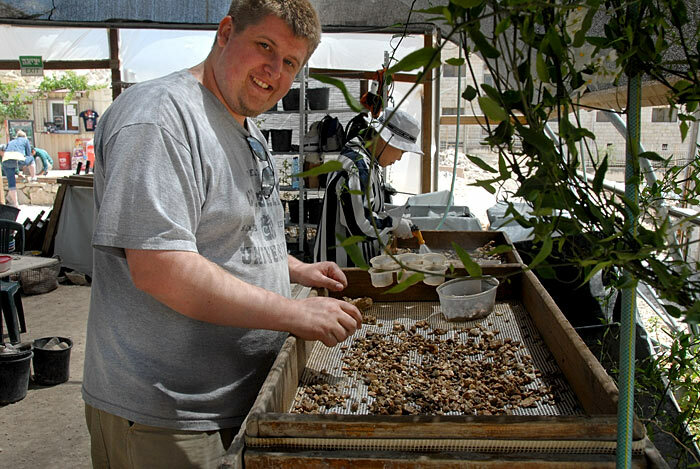 Of course there was a shopping stop, this one at the Ahava cosmetics company where they make all their products from elements found at the Dead Sea. There were several of these tree/bush plants growning around there...I wonder what it is? 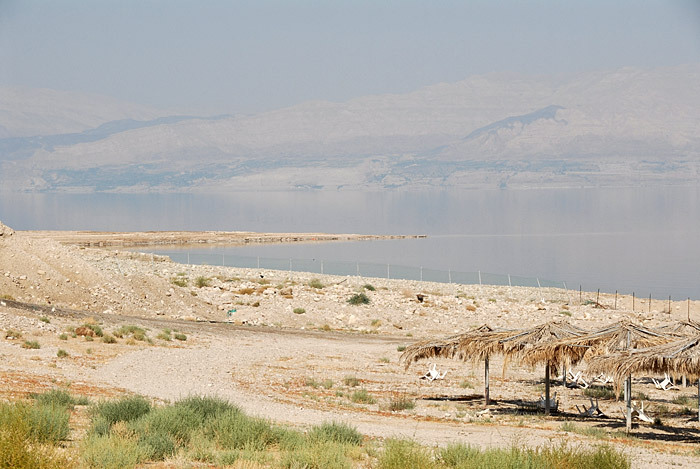 "The tree grows mainly in the Ein Gedi area, and when damaged the leaves will exude a milky liquid which is poisonous. The fruit is large and round, but completely hollow inside except for some fine hairs and seeds. 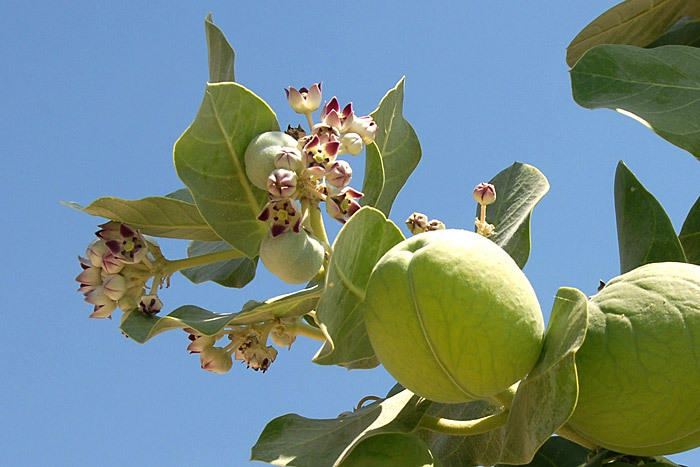 "The plant is also known as Sodom's apple. Legend has it that when God decided to destroy Sodom and Gomorrah, he also decided to transform the trees into trees that served no use, and so the once famous and delicious apple trees that were found in that area, today bear beautiful fruit that is useless, and even poisonous." 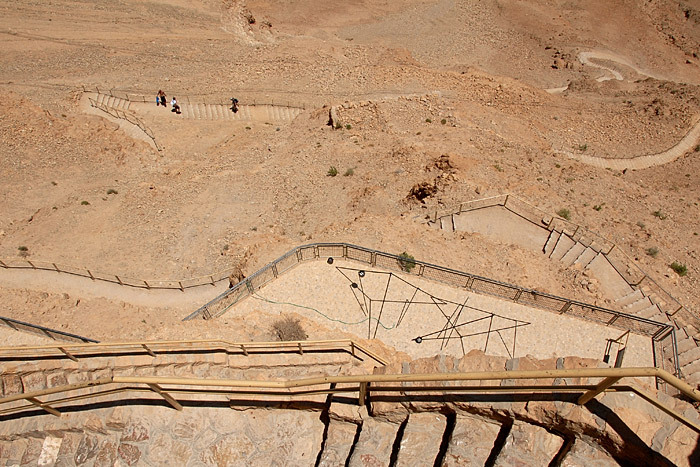 What you're seeing down there is what they call The Snake Path leading up to the UNESCO World Heritage site of Masada. Yikes. 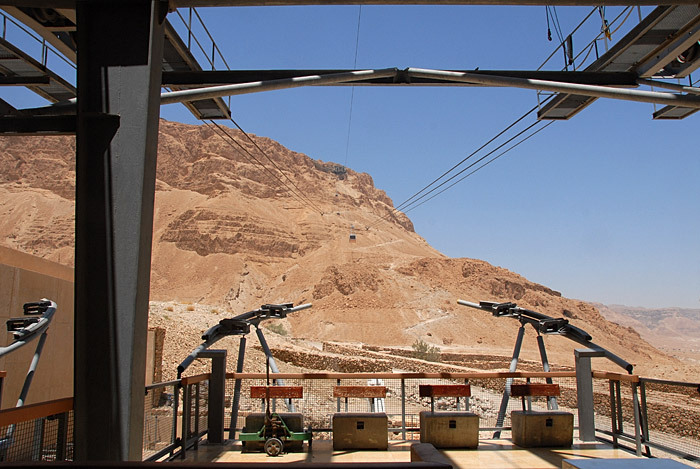 ...we took the aerial tramway! At the tramway exit point, The Snake Path is visible below. 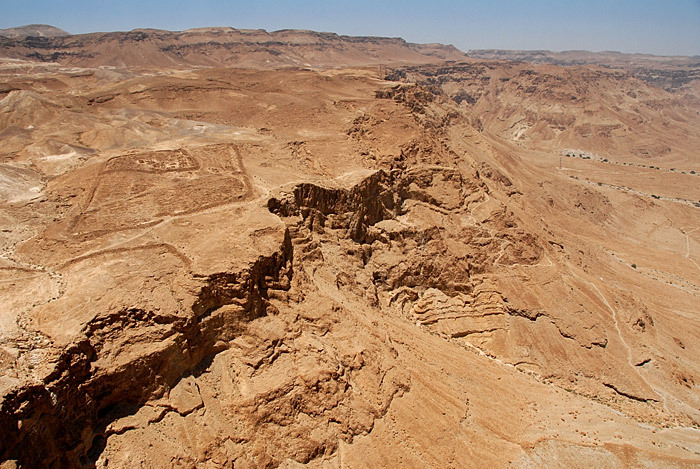 There are two separate and basically unrelated parts of the Masada story, 90 years apart. 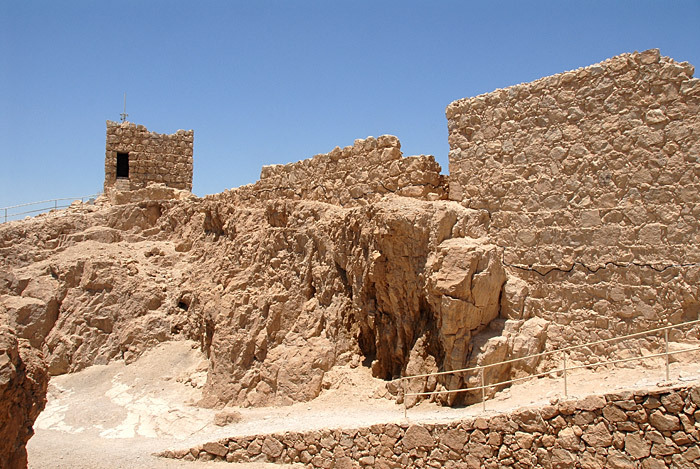 The first is the building of the fortress by King Herod around 30-20BC and the second is about The Great Revolt of the Jews against the Romans beginning in 66AD. 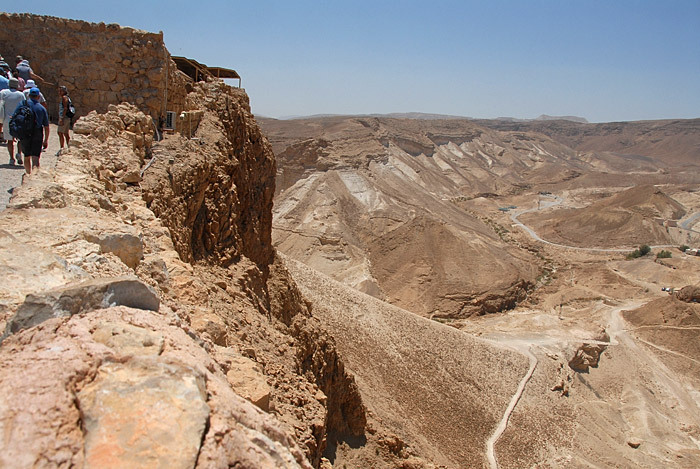 Why people particularly care about Masada now, it's all about The Great Revolt. 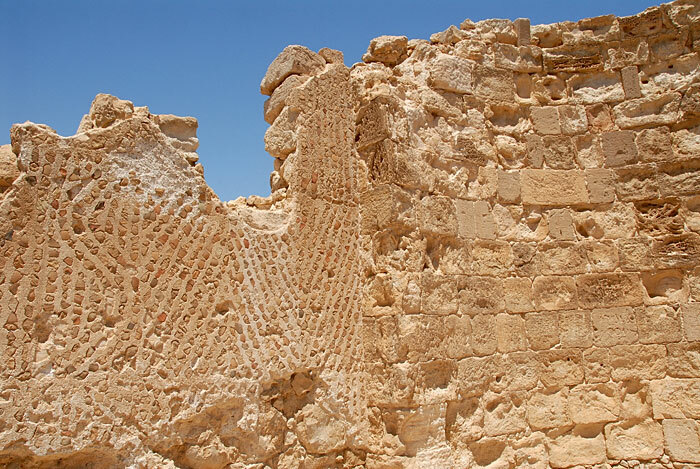 The fortress in King Herod's day included an elegant water delivery system, elaborate palaces, and massive defensive features. 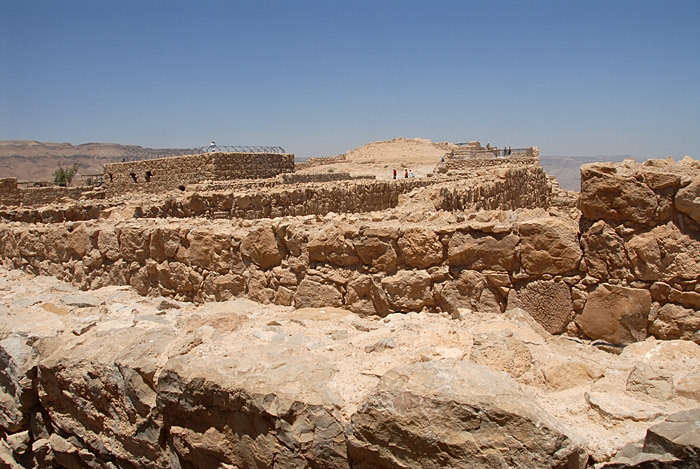 After Herod's death in 4BC and the annexation of Judea to the Roman Empire in 6AD, only a small Roman garrison remained at Masada. 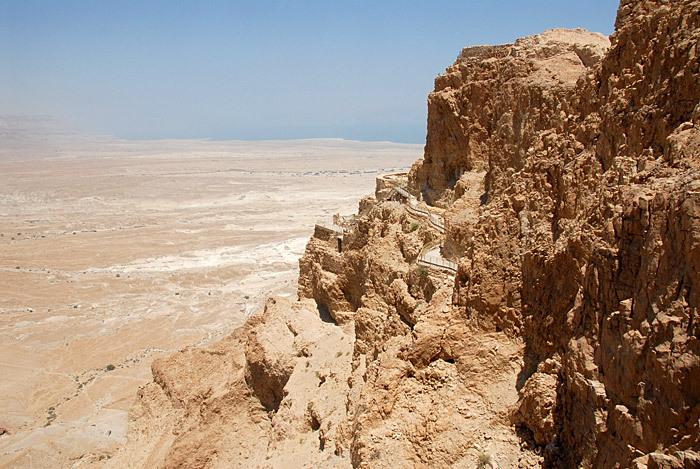 So by 66AD when the Jewish rebels fled to Masada much of what had once been grand was abandonded and had suffered from earthquake damage. See that black line...below the line are original walls and above are the more modern restorations. Our colorful and informative guide who said every sentence in both English and Spanish. 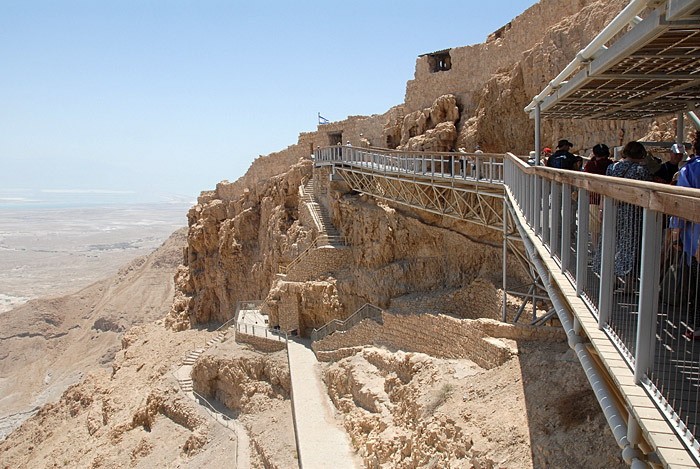 "The account of the siege of Masada was related to Josephus (a Jewish-Roman historian) by two women who survived the suicide by hiding inside a cistern along with five children, and repeated Eleazar ben Ya'ir's exhortations to his followers, prior to the mass suicide, verbatim to the Romans." "Because Judaism strongly discourages suicide, Josephus reported that the defenders had drawn lots and killed each other in turn, down to the last man, who would be the only one to actually take his own life." 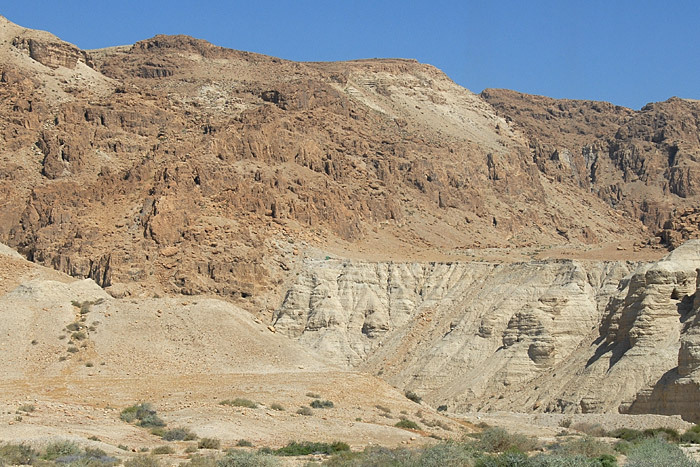 Visible are some of the remains of the Roman garrisons that surrounded Masad. 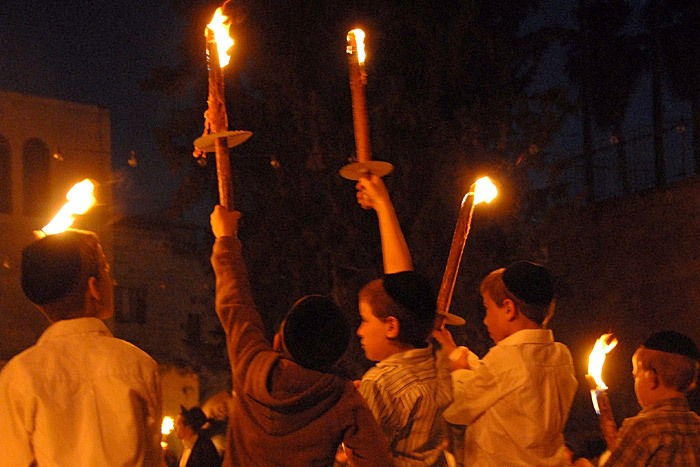 "Josephus says that Eleazar ordered his men to destroy everything except the foodstuffs to show that the defenders retained the ability to live, and so chose their own death over slavery, but archaeological excavations have shown that storerooms which contained their provisions were also burnt, though whether this was by Romans, by Jews, or natural fire spreading is unclear. "Josephus also reported that the Romans found arms sufficient for ten thousand men as well as iron, brass and lead which casts further doubt on the accuracy of the account, especially when considering Josephus' predilection for exaggeration." 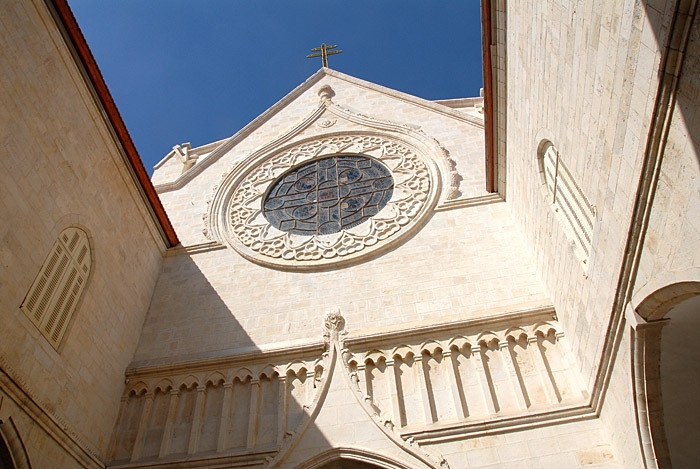 After the Romans left, the fortress remained uninhabited until the fifth century AD when a few hermits of the Byzantine era made a monastery here, but with the rise of Islam in the seventh century the monastery apparently ceased to exist. 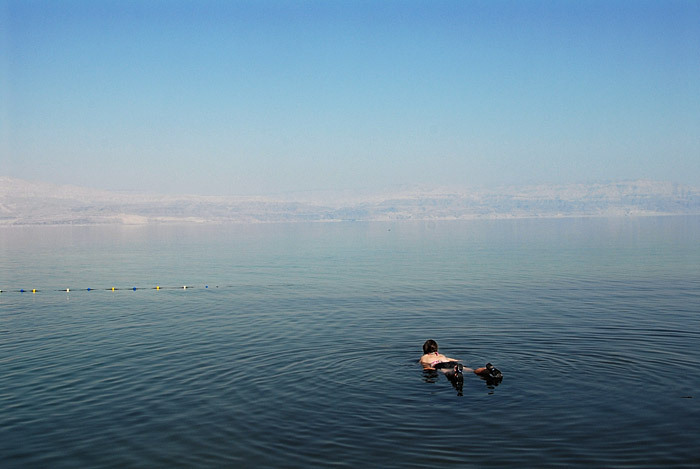 The Dead Sea, and that's Jordan in the distance. I went down there and did all this and then I went back up (it was a schlep!) to shower, change, and get the camera. 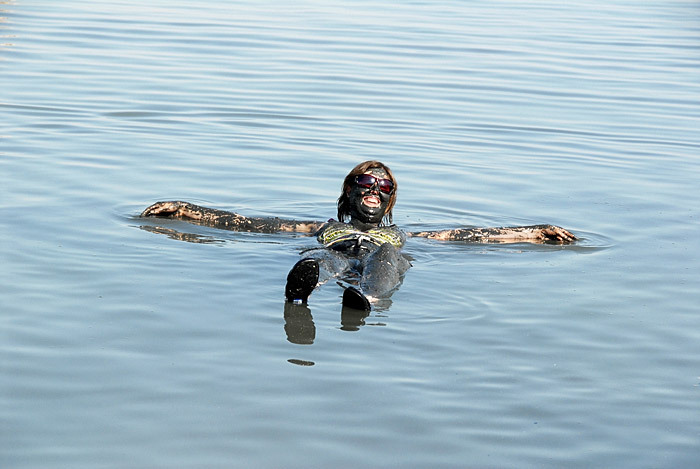 It's true, you cannot sink in the Dead Sea. Back in Jerusalem now after my trip Up North. 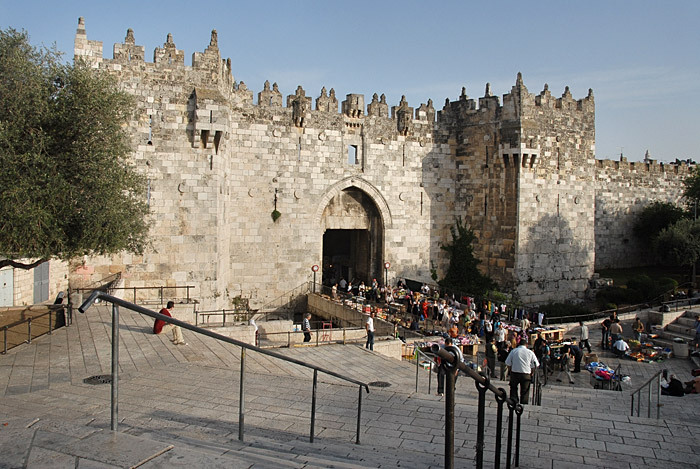 I am coming down the stairs from my hostel just across the street from the Damascus Gate. It's the most central location I've stayed and as you'll see later, it's BBBusy. Off for a morning walk, without knowing I found myself at the gates of the American Consulate. 'They' wouldn't let me take a picture of the Consulate so I took a picture of the building next door. 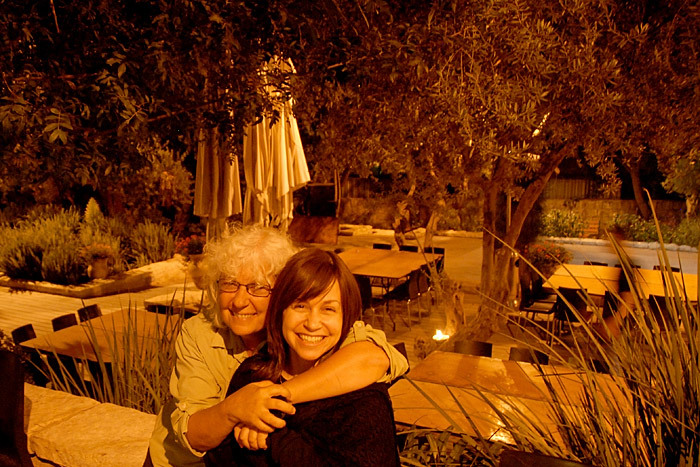 We're in East Jerusalem here btw. All the Embassies are in Tel Aviv - it's political of course. 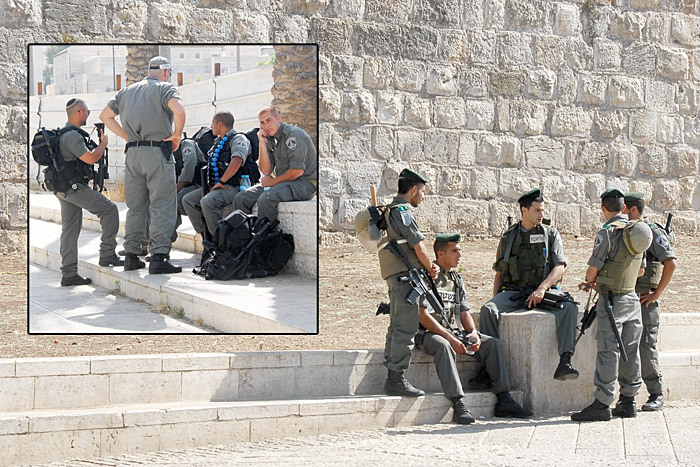 Israel wants the world to say the 'complete and united' Jerusalem is its capital city, but the world is resisting. 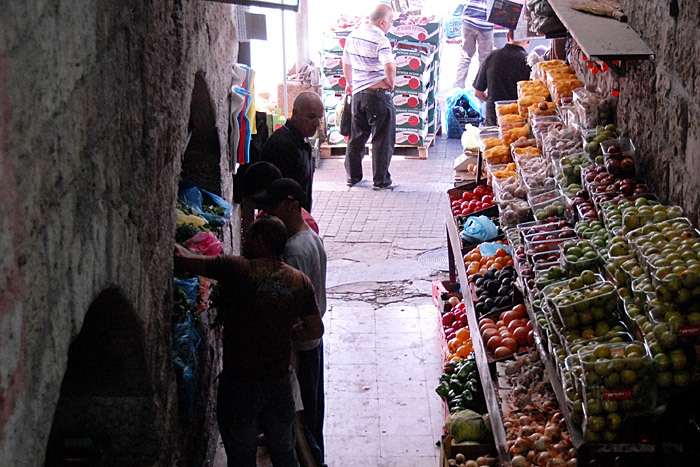 It's Saturday and I'm wandering in East Jerusalem again because things are open. 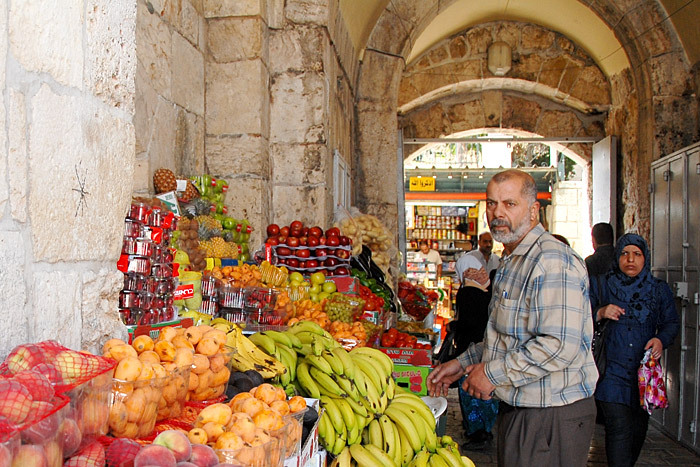 I seem to find myself in the Arab areas a lot because they tend to be 1) historically older, 2) cheaper, and 3) open. 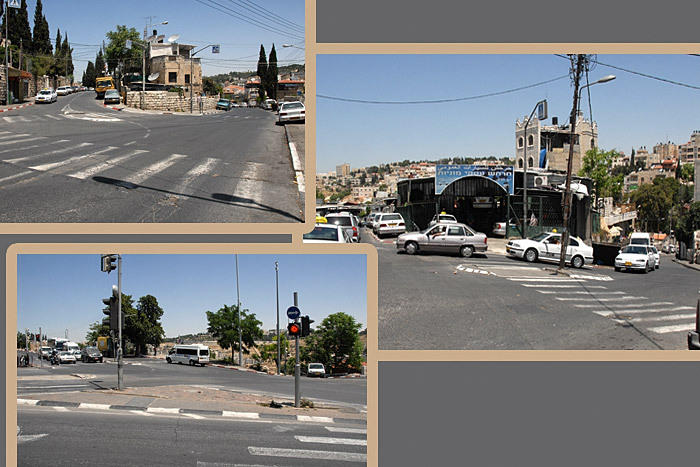 In the 12 days I've been in Israel approximately 4 1/2 of those days have been days when there is basically nothing happening in the Jewish areas and no long distance transportation - Fri-Sat twice and Tue-Wed once. 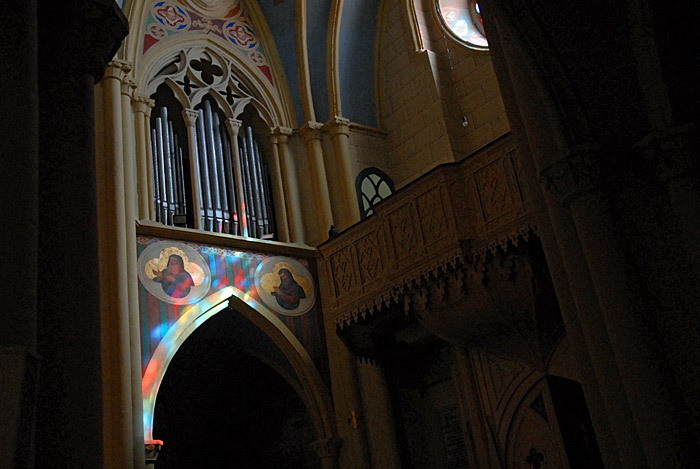 A group was getting a private organ concert, or semi-private since I went in. 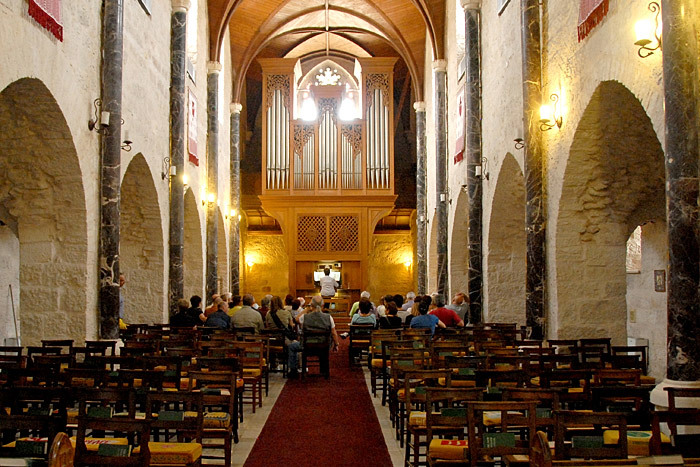 It's not a very grand church but it is the seat of the Bishop of Jerusalem of the Episcopal Church in Jerusalem and the Middle East so it gets to be a cathedral. I mentioned before about all the familiar So-Cal plants. Here's another one. 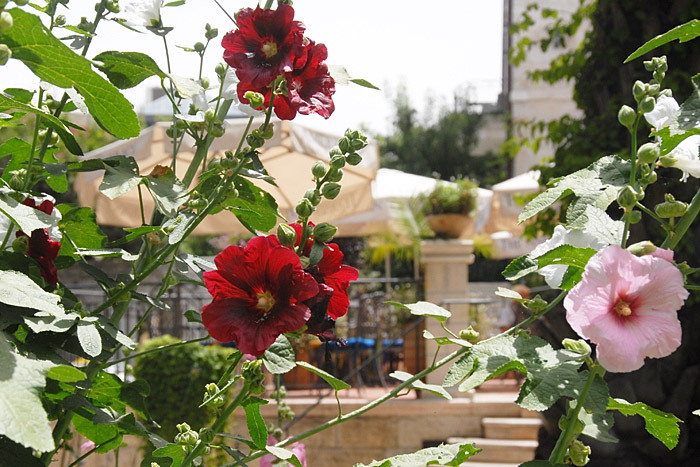 Hollyhocks are growing happily everywhere. 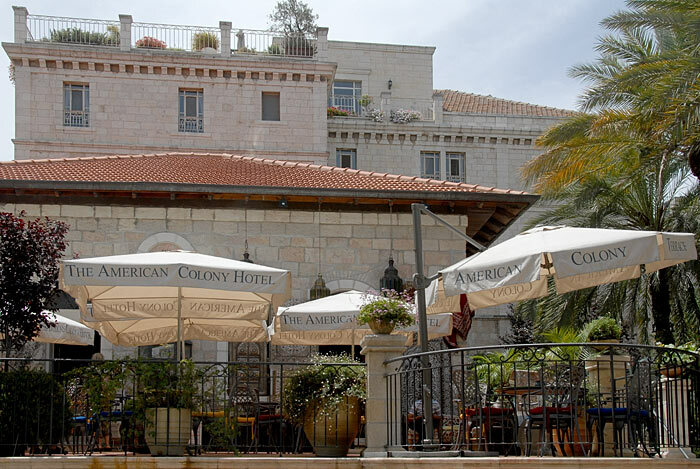 The American Colony Hotel on the same street as the US and British Consulates. From a Palistinean crafts shop on my trek up Mount Scopus. 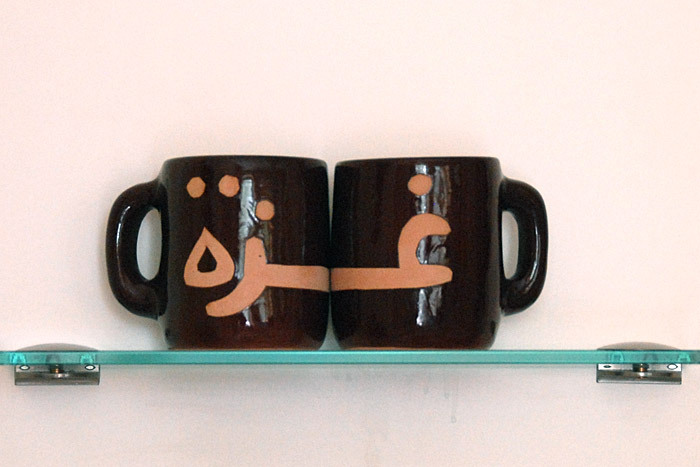 It says 'Gaza'. I was hoping for something else, but what? 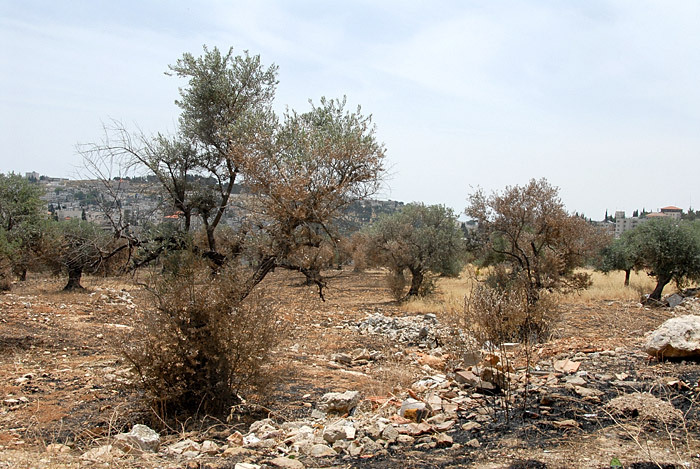 Olive trees - a very political commodity in Israel. Which brings us to the controversial barrier Israel is building basically along, but sometimes across the 'green line' with the West Bank and East Jerusalem. 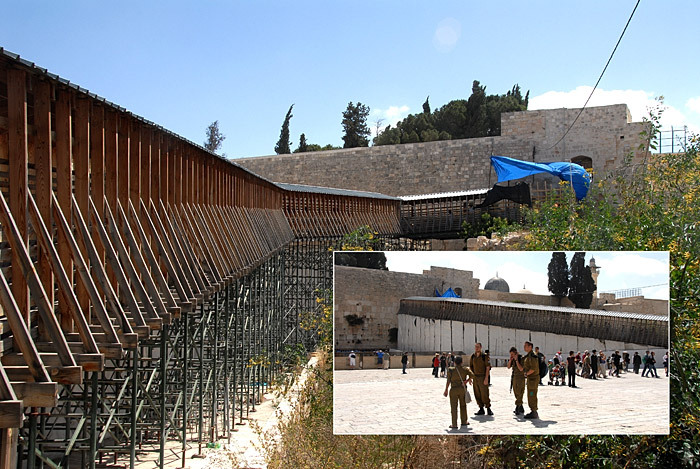 "Israelis most commonly refer to the barrier as the "separation fence" and "security fence" or "anti-terrorist fence". Palestinians most commonly refer to the barrier as the "racial segregation wall" in Arabic, and some opponents of the barrier refer to it in English as the "Apartheid Wall."" 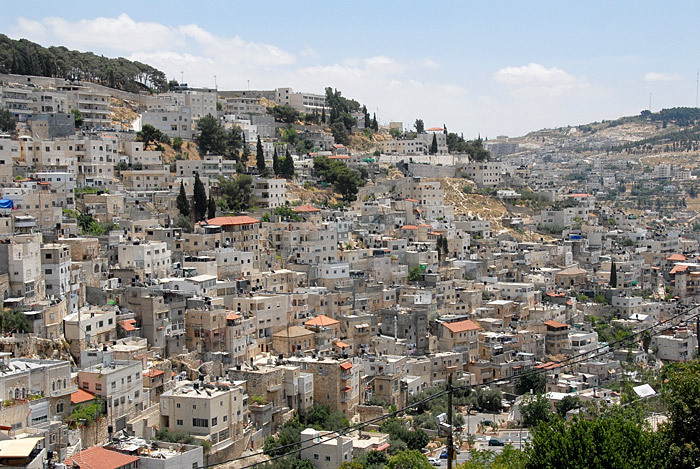 Not to mention the settlements, another huge and powerfully dividing issue. Maps of the land designations in Israel through 1967. 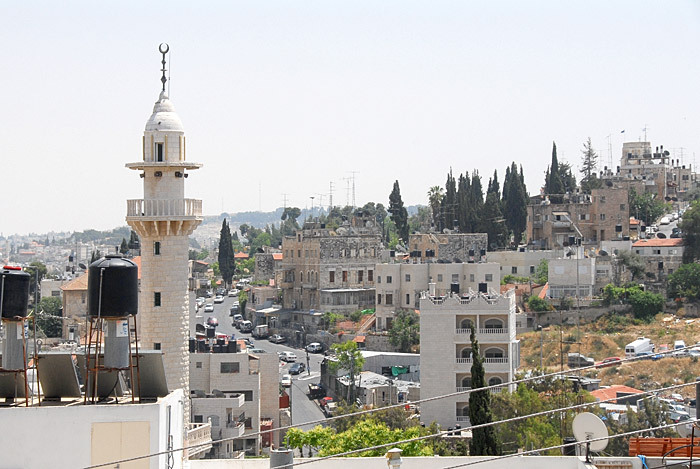 Since then, Israel annexed (as opposed to occupying) East Jerusalem in 1980 and the Golan Heights in 1981 which has not been recognized by any other country. 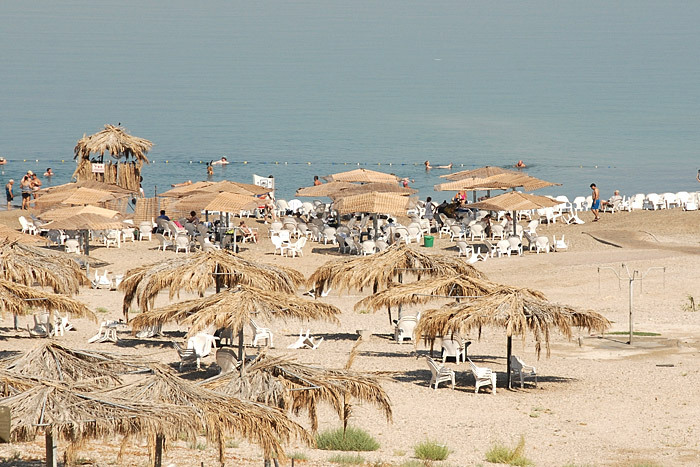 In 1982 Israel withdrew from Sinai returning control to Egypt. A view of the Old City from my street. 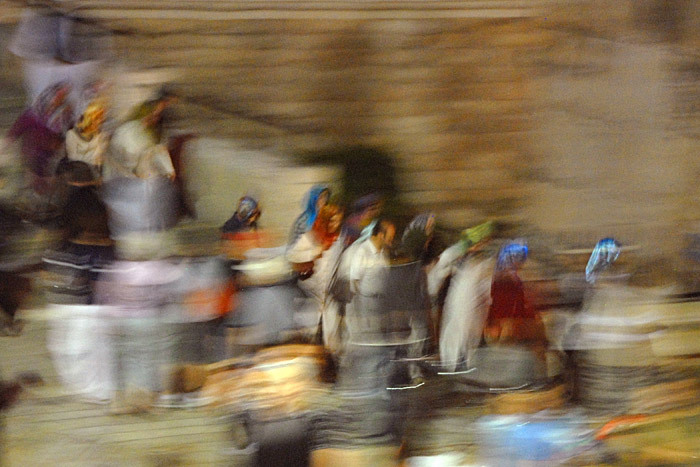 It's Friday night and observant Jews are streaming into the Old City, moving at top speed, running almost. ...all of a sudden they were filled, Filled with these women also hurrying to their destination. 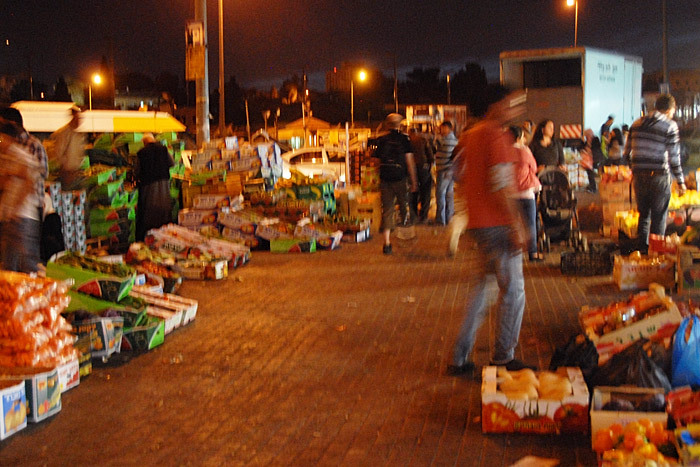 We are definately in Arab East Jerusalem since this market was raging right outside my hostel from Friday mid-day until late Saturday, the exact time when everything Jewish is closed. 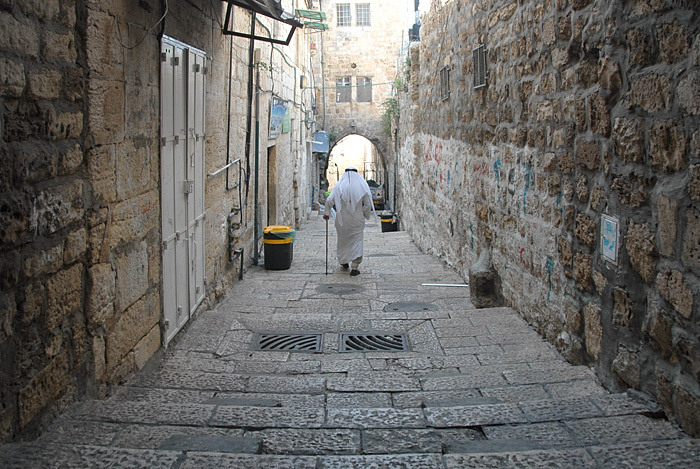 And it was through this street that so many of the Jewish people hurried to their Friday night observances. How is this all going to work out in the long term? I have no idea. I went back into the Old City today. Check in the circle - you can see the small tire attached to the cart. When the cart gets going too fast the guy drags on the tire with his foot, or jumps on in the worst case, to slow it down. 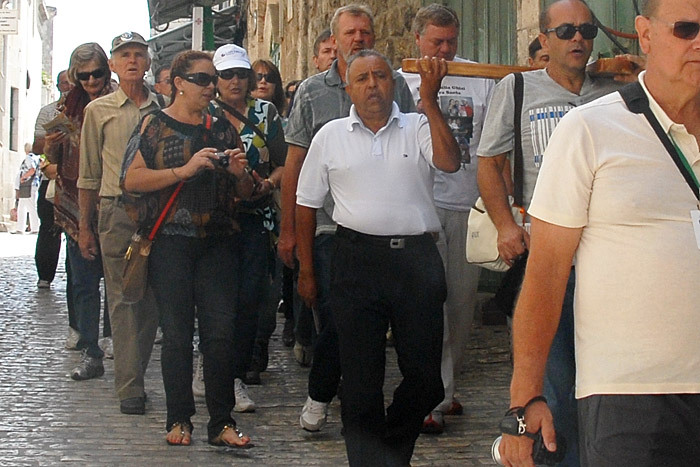 This is another one of the stops in the Stations of the Cross on the Via Dolorosa. 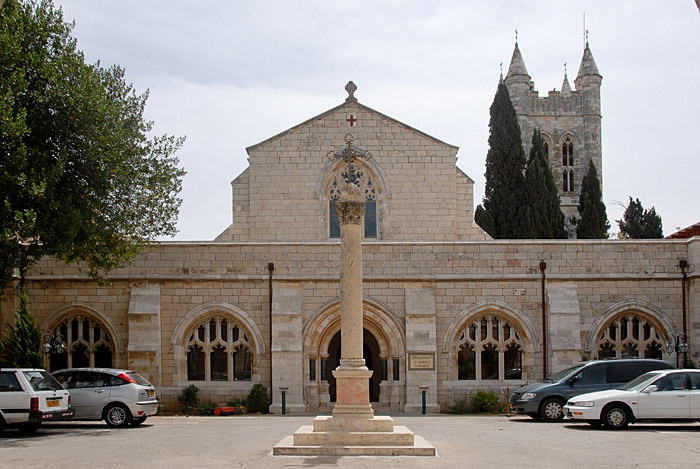 Christians these days don't seem to be making too much of a fuss over Jerusalem but not to forget the Crusader occupation of a hundred years or so. And not to forget the recent calls for a New Crusade, or plans for the Second Coming. 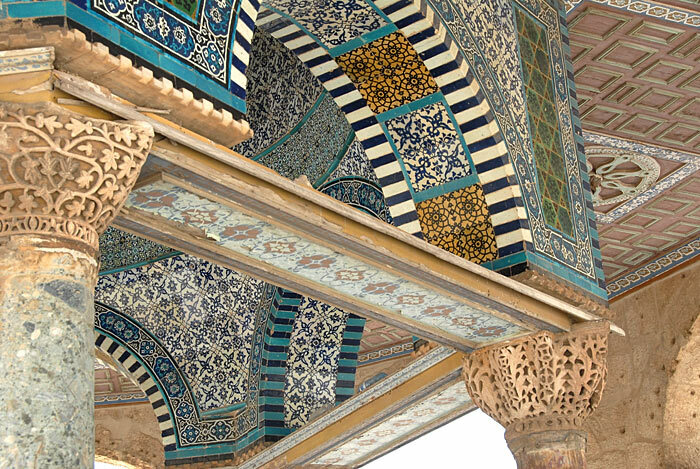 I just got an email from Roger and he says this: "I once heard a Muslim leader in L.A. address an interfaith gathering this way: "Thank God," he said and paused, "that Buddha and Krishna did not also go to Jerusalem!"" 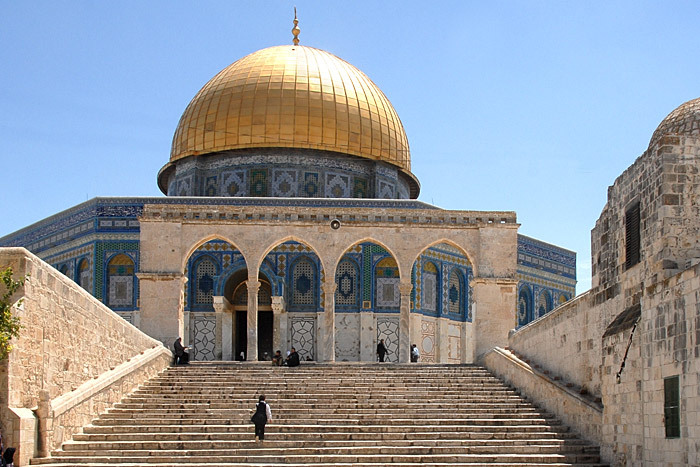 I came back to the Old City because I hadn't yet visited the Temple Mount/Dome of the Rock. For the Jews it's the Number One holiest place, and for the Muslims it's Number Three so I was thinking... maybe one could trump three? HA. Oh boy, talk about a long story. 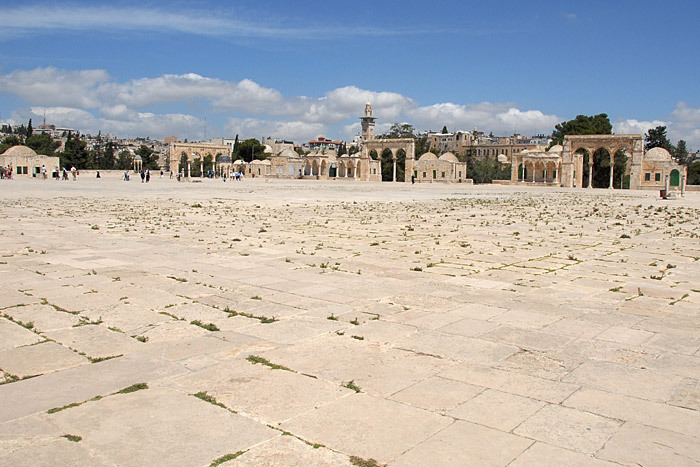 This huge rectangle of land is operated by an Islamic Wakf who has "managed the Temple Mount continuously since the Muslim reconquest of the Kingdom of Jerusalem in 1187". To get in you have to go through a separate security check and through this long ramp. 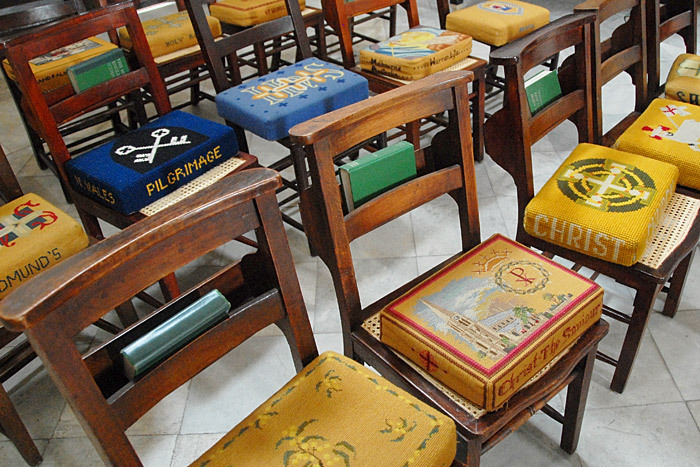 See those two guys on chairs. When I went up to look for signs they shooed me away. What is this building, I asked. 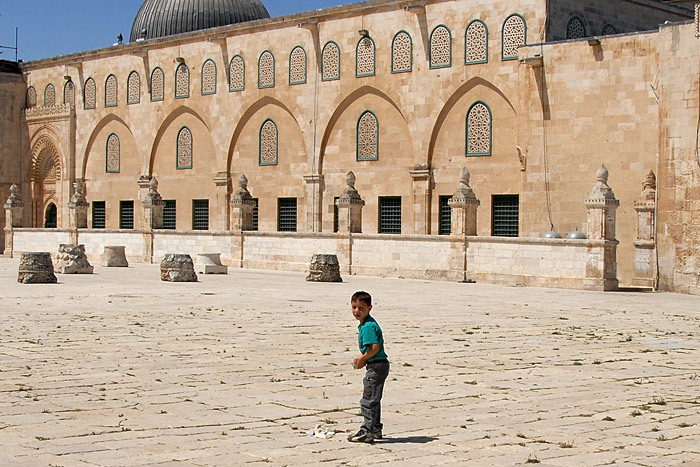 ALL, one guy replied, ALL this, (taking my map and drawing a line around the whole huge Temple Mount area) ALL this is Al Aqsa Mosque. ALL this. They were certainly making a point. 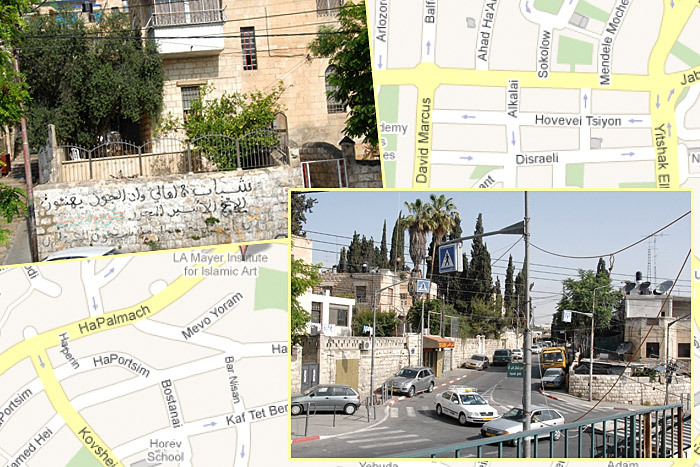 On the map btw, that building here is called Al Aqsa Mosque and the other buildings have their own names. 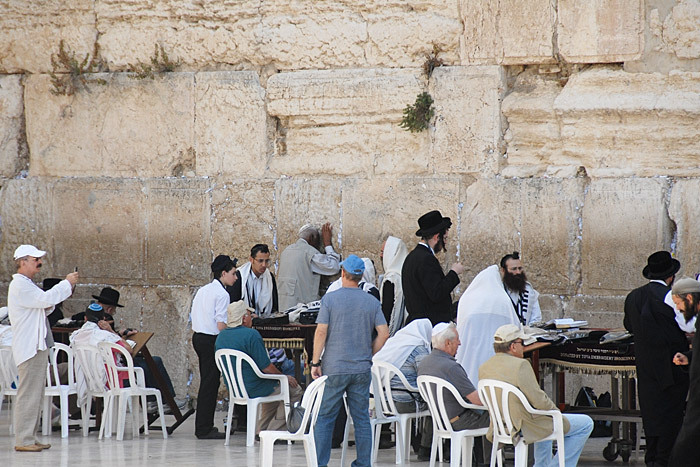 "A few days after the war was over 200,000 Jews flocked to the Temple Mount and Western Wall in the first mass Jewish pilgrimage since the destruction of the Temple in 69 CE. 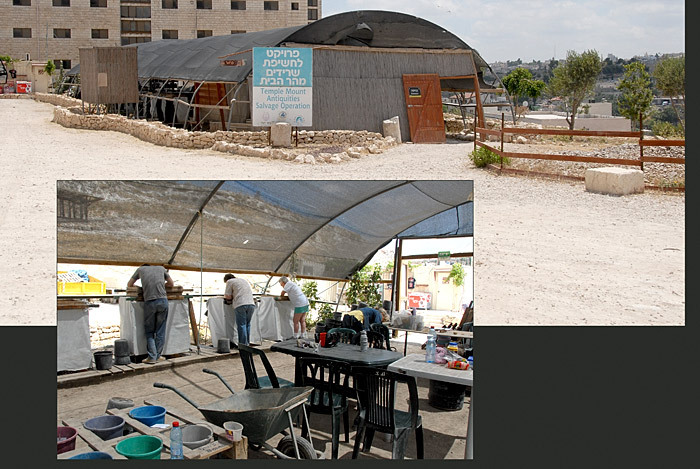 However, the Israeli government subsequently left the Islamic Wakf in control of the site, although it remains under Israeli sovereignty. 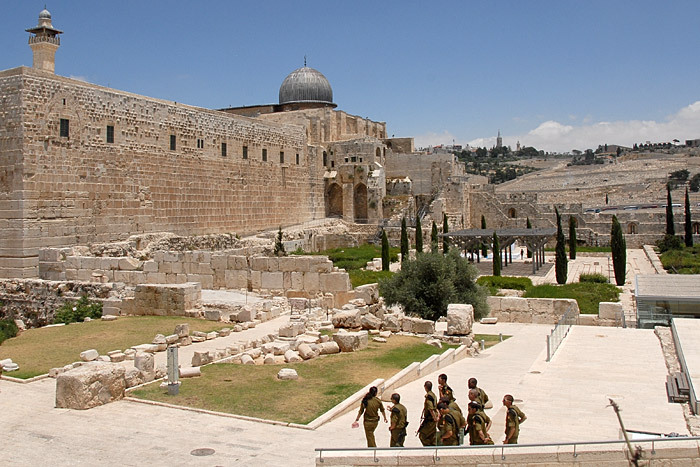 "Because of this set-up, the site has become a flash-point between Israel and the Muslim world, especially when violent acts are perpetrated at the site. 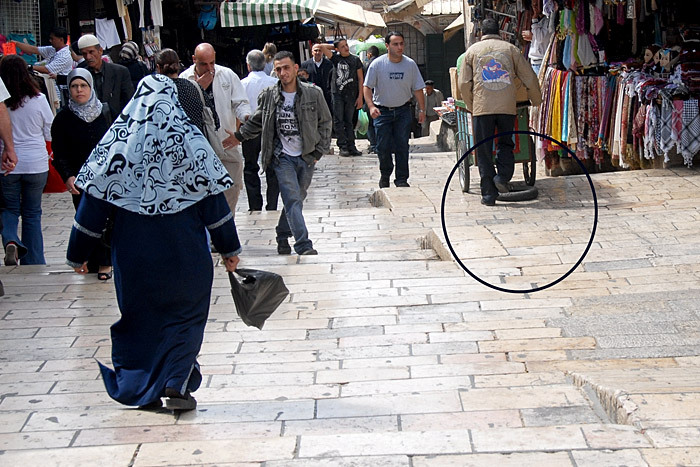 Today Jews are generally banned from praying on the Mount or doing anything that could disturb Muslims." 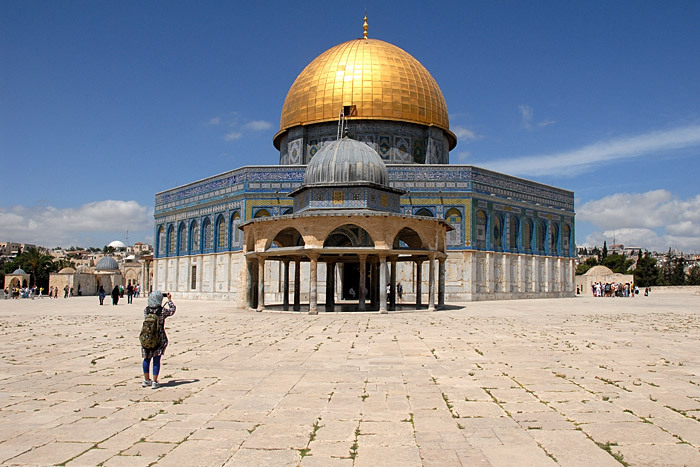 There are four paragraps in the wiki article about the Temple Mount as to whether Jews are or are not permitted (by their own religious authorities) to enter the Temple Mount. 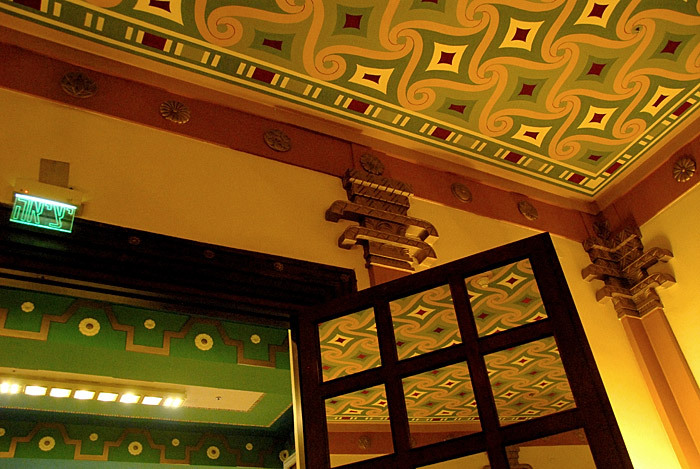 ...excellent tile work - this is from the pavillion you can see in the picture above. It's a huge site (I think 36 acres, but that might not be right) with the structures on a built-up area and gardens surrounding. 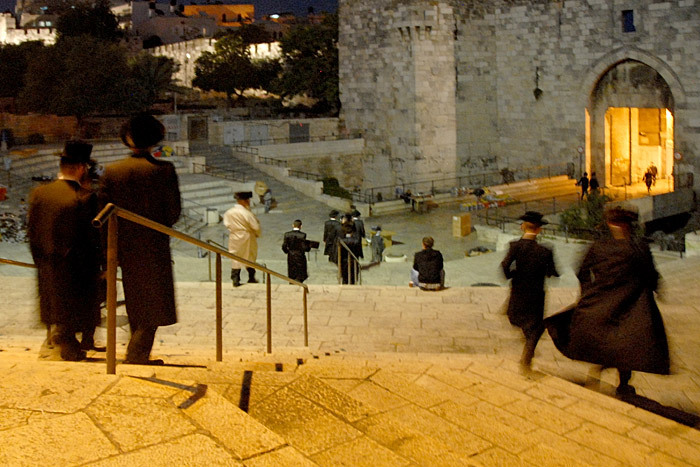 "Due to (Jewish) religious restrictions on entering the most sacred areas of the Temple Mount (see following section (that's the wiki article I mentioned)), the Western Wall, a retaining wall (of) the Temple Mount and remnant of the Second Temple structure, is considered by some rabbinical authorities the holiest accessible site for Jews to pray." 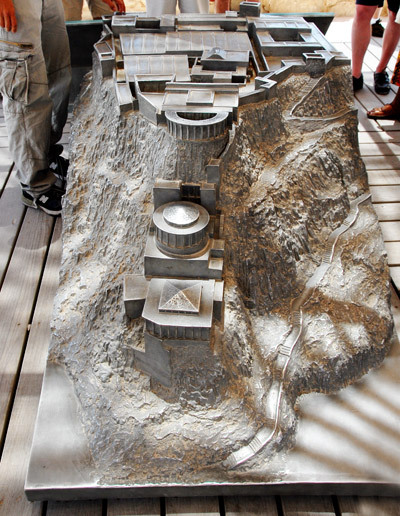 "Jewish texts record that the Mount will be the site of the Third Temple, which will be rebuilt with the coming of the Jewish Messiah." When the Messiah does come he's going to get his temple built no matter who's running the place, I would think. 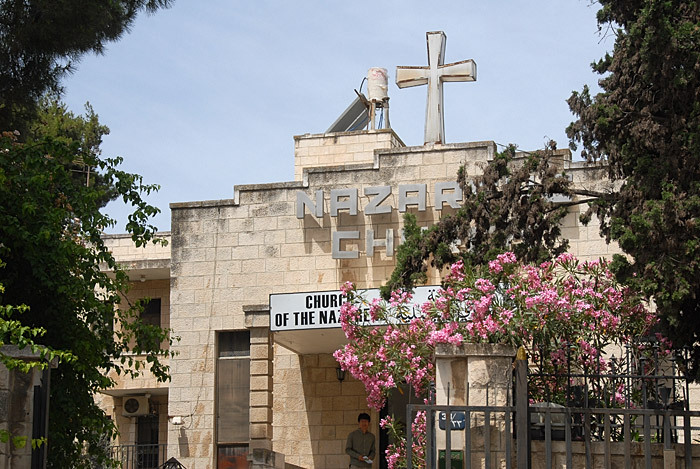 Then there are the Christians who are encouraging the building of the Third Temple now because that will mean the Second Coming of the Messiah (the Jews having missed the first one...), the resurrection of the dead, the Rapture etc. and hellfire and damnation for all the rest of all y'all. ...we had to go up here. This is the view. 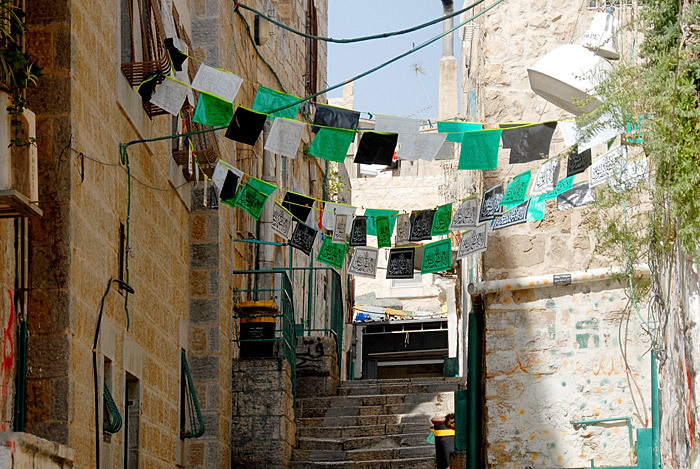 Back on the streets of the Old City. Past the southern wall of the Temple Mount, I'm now walking to visit an archaeological site of the City of David. 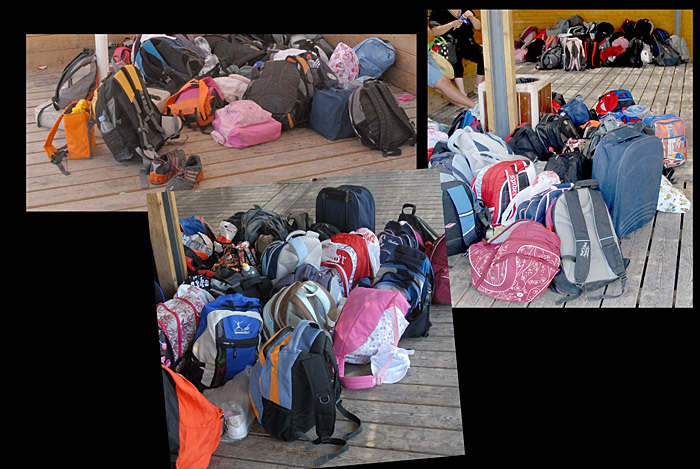 What you can see here are four piles of backpacks. There are fourteen more. And you know, the boys roughhousing and the girls squealing - tweens, it's the same in any language. 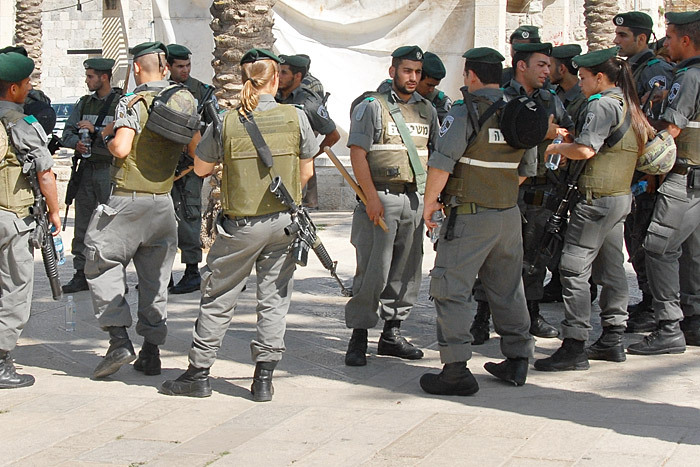 I am going to extract from an article in The Jerusalem Post. 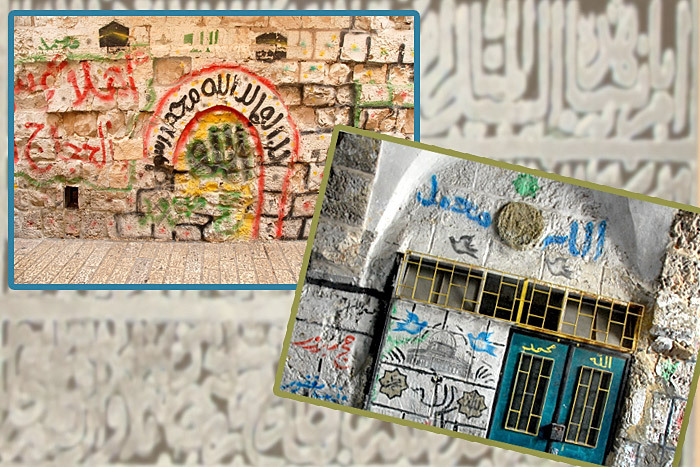 "In 1999, the Wakf Islamic trust, ... requested permission from the government to construct emergency exits (from some tunnels under the Temple Mount) ... Upon receiving permission, ... During the exits’ construction, the Wakf removed some 10,000 tons, or 400 truckloads, of ancient debris, which was then dumped ... some of it lost forever among the trash and other rubble. 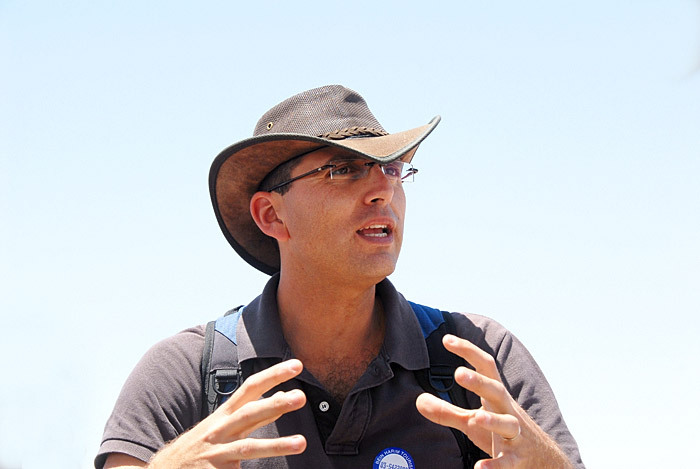 "Enter Gabriel Barkay of Bar-Ilan University, who applied for and eventually received a license from the Israel Antiquities Authority to sort through the discarded piles in search of antiquities. 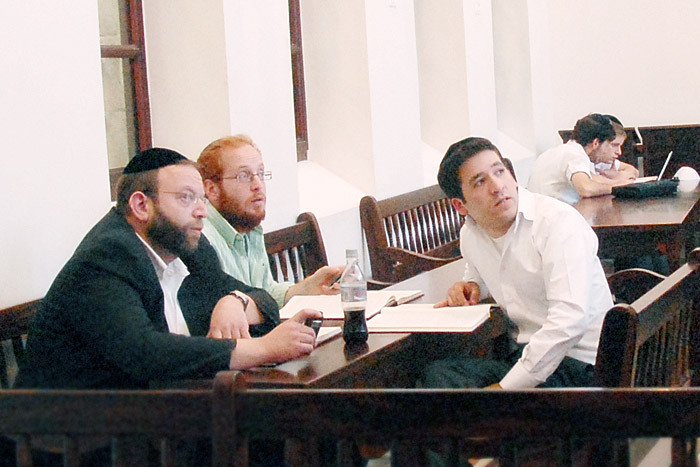 Joined by his former student Zachi Zweig (Jonathan's wife Judy's brother), Barkay now oversees the sorting. 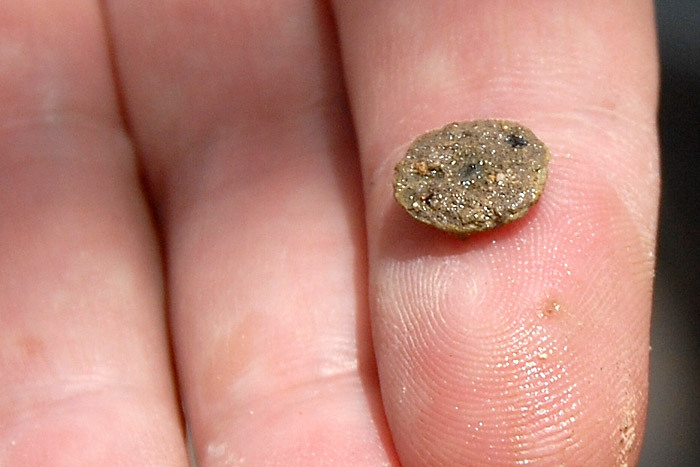 ... the efforts have turned up a rich bounty of First and Second Temple-era artifacts.
" 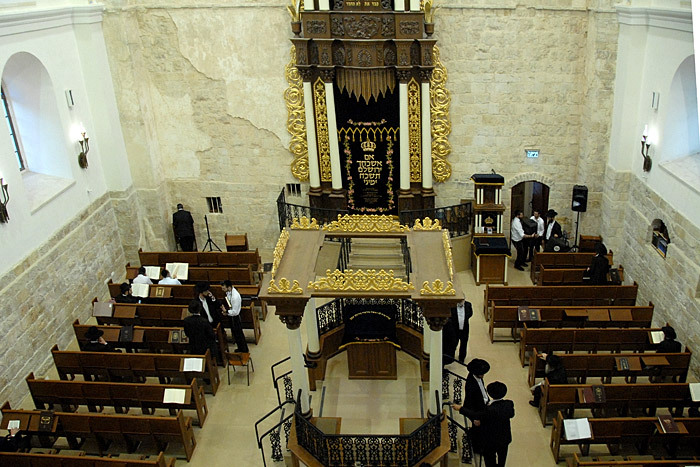 ... Other MKs echoed Ben-Ari’s observations, expressing the importance of the site’s offerings for “all Israelis, and all of the Jewish people. 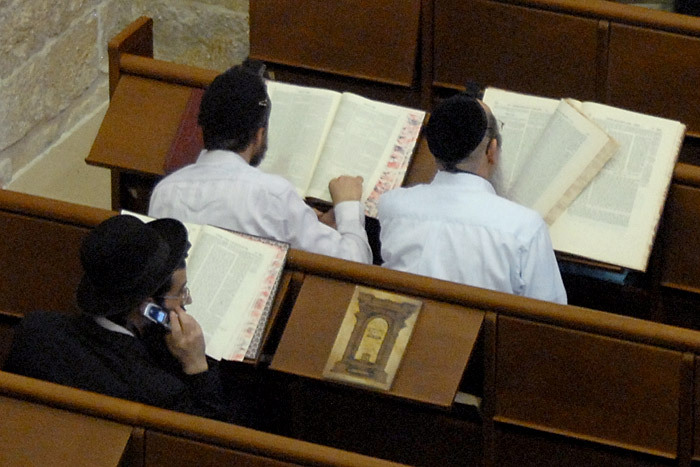 “This is a clear sign that Jerusalem is ours – that its beginnings belong to the Jewish people, and the basis of its holiness is rooted in Judaism,” said Kadima MK Otniel Schneller, who was also in attendance." ...he found the treasure of the day, an old coin. Karma?! 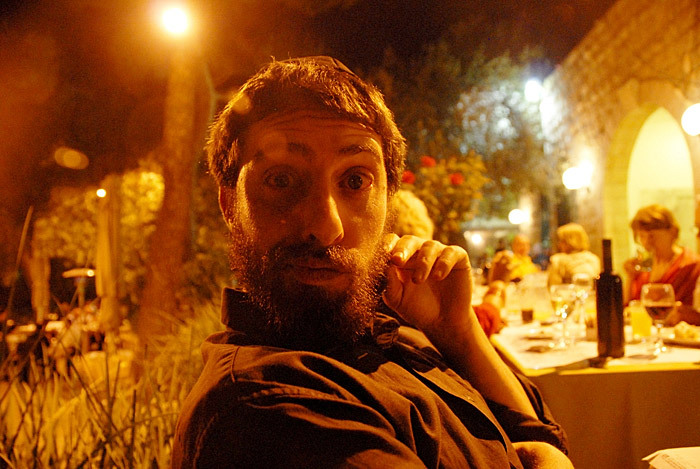 My last day in Israel, then tomorrow - Roma! 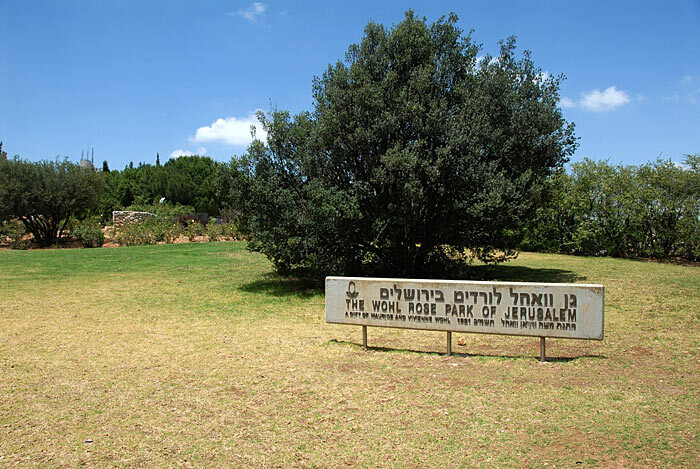 I had an adventure in Public Transportation today, getting to this place, The Wohl Rose Park of Jerusalem, and Bird Watching station, and in the end it was entirely worth it. The local buses are not so easy to manage because there is no map that shows the routes. You can find the bus numbers online but you have to know what route you want to take which I gave up on, not finding an English version. So I just went out and started asking. I've taken taxis only a very few times because every trip is a negotiation and I'm not good at that, At All. I've also used the sheroot(sp?) system a lot - like a shared van, on and off, down one street or to a specific destination. Once you get the knack of them it works out well. The trains and long distance buses are my favorites because you know the price, you know where to get on, and where it will take you. You can imagine how fab this would be during blooming season! There were acres of these all in various plantings. 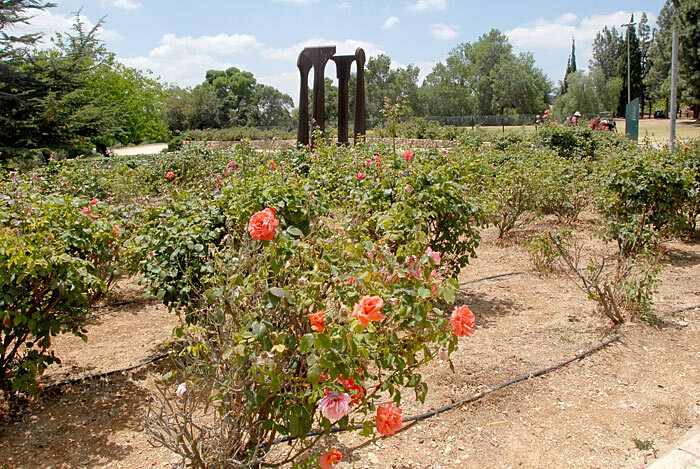 Formal gardens, English gardens, climbing arcades, and More. 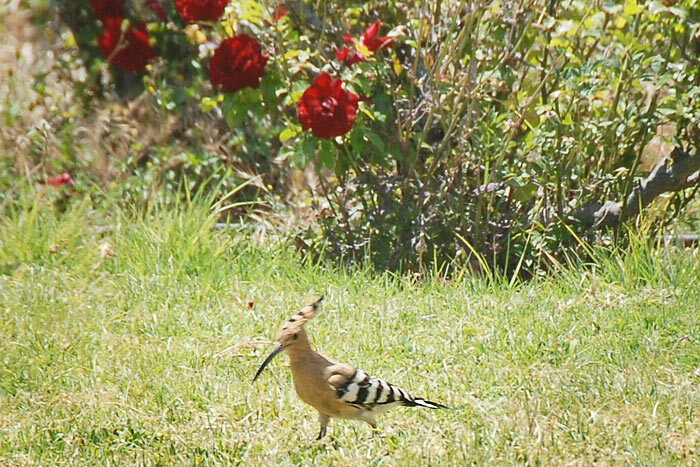 ...there were plenty of birds in the Rose Garden. Check out that dude's Head. 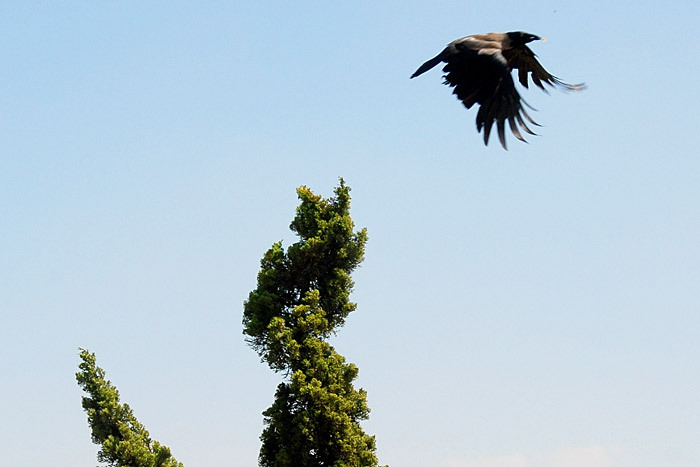 People have told me these are crows and they look everything like crows we are used to, maybe even bigger, but instead of being all black they have gray patterns on their bodies. 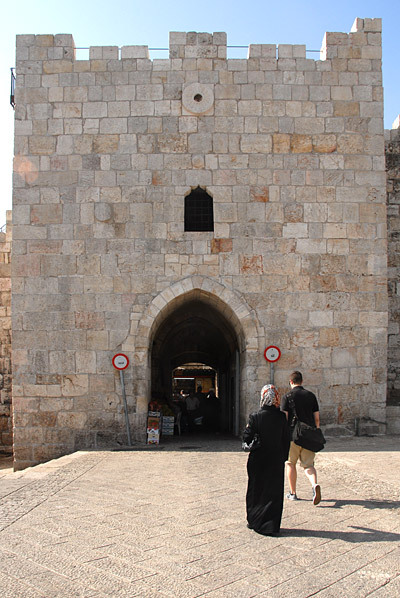 Back from my outing I took the bus that would drop me off at the Jaffa Gate and snaked my way through the Old City. He gave that little 'follow me' head toss and I was in! Down some halls, around some corners, through some doors. Here it is, direct from France. Jonathan is a bit of a celebrity here having been in the first group of seven to come to the altar on the first Friday that the rebuilt synagogue was opened in early 2010. 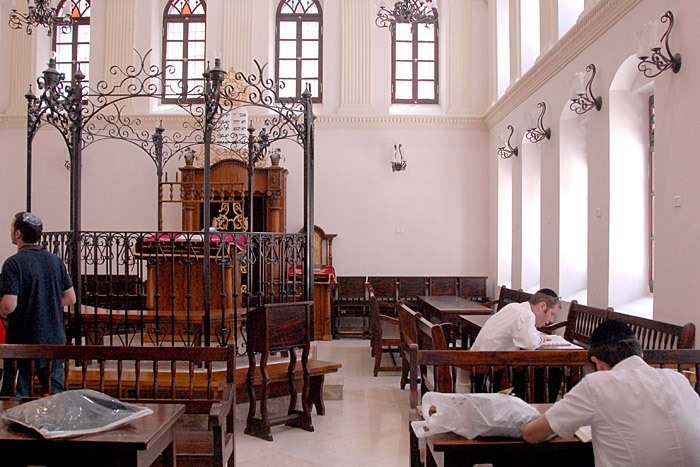 "In 2005, construction and restoration of the synagogue began and it was gloriously dedicated on the first day of the month of Nissan, 5770 (2010)." I copied this all in so you could get a feel for the language. ...standing up on tippy-toes in the women's balcony with my camera hung over the top of the window's barrier. Judy thought that guy on the phone might be her brother. 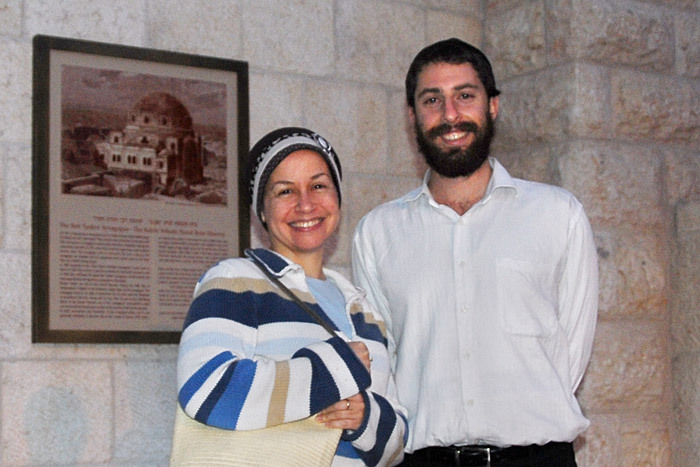 Jonathan, Judy, and I met in the plaza of this synagogue for dinner and Something was about to happen. There were about a hundred of these boys. 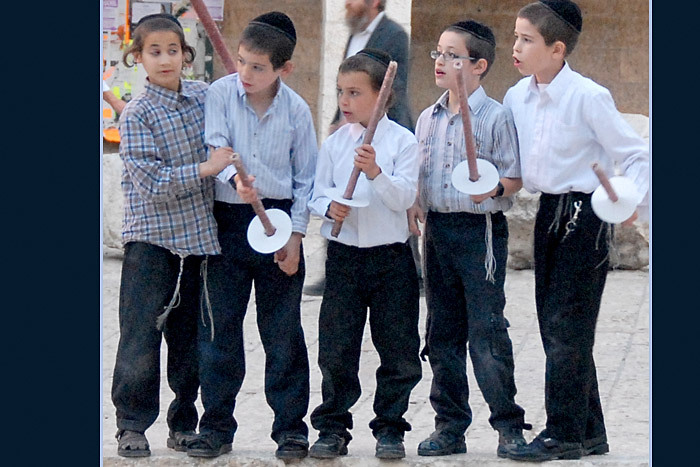 If you guessed they were sword fighting with those things, which they were, you would be only one-quarter right. Actually, what they are doing is playing with fire! 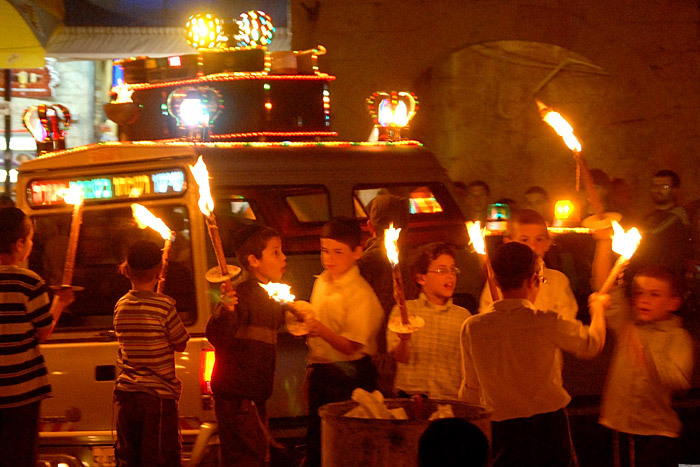 One hundred young boys with flaming torches. Yup. I didn't hear any ambulances either. 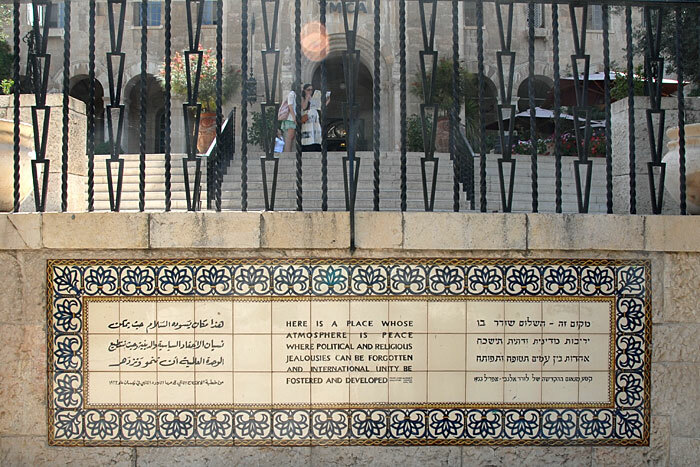 ...which filled the plaza in front of the synagogue. And once the torches burn out - Candy! We ate dinner at a kosher shawarma place on the plaza so we could keep an eye on the haps. 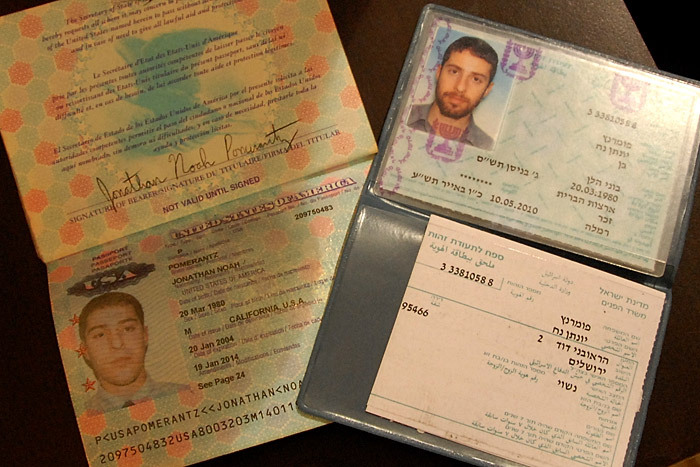 ...and Jonathan's legit now too, a dual citizen. And on that note I bid to Israel, Shalom!